For the more general category of electric drive for all type of vehicles, see electric vehicle. For the specific electric drive cars, see electric car and plug-in electric vehicle. Top-selling light-duty plug-in electric vehicle global markets by country or region as of December 2018[update]. Comparison of plug-in electric car ownership per capita in selected top selling countries and regional markets as plug-in cars per 1,000 people, as of December 2018[update]. Electric car use by country varies worldwide, as the adoption of plug-in electric vehicles is affected by consumer demand, market prices and government incentives. Plug-in electric vehicles (PEVs) are generally divided into all-electric or battery electric vehicles (BEVs), that run only on batteries, and plug-in hybrids (PHEVs), that combine battery power with internal combustion engines. The popularity of electric vehicles has been expanding rapidly due to government subsidies, their increased range and lower battery costs, and environmental sensitivity. However, the stock of plug-in electric cars represented just about 1 out of every 250 motor vehicles on the world's roads by December 2018. Global cumulative sales of highway-legal light-duty plug-in vehicles reached 2 million units at the end of 2016, 3 million in November 2017, and the 5 million milestone in December 2018. Sales of plug-in passenger cars achieved a 2.1% market share of new car sales in 2018, up from 1.3% in 2017, and 0.86% in 2016. The PEV market is shifting towards fully electric battery vehicles. The global ratio between BEVs and PHEVs went from 56:44 in 2012, to 60:40 in 2015, and rose to 69:31 in 2018. As of December 2018[update], China had the largest stock of highway legal light-duty plug-ins with over 2 million domestically built passenger cars. China also dominates in plug-in electric bus deployment, with its stock reaching 343,500 units in 2016 out of global stock of about 345,000 vehicles. As of September 2018[update], the United States had one million plug-in cars, with California as the largest U.S. plug-in regional market with 537,208 plug-in cars sold up until December 2018. More than one million light-duty passenger plug-ins had been registered in Europe through June 2018, with Norway as the leading country with over 296,000 units registered by the end of 2018. 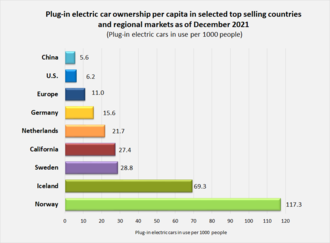 Norway has the highest market penetration per capita in the world, and also has the world's largest plug-in segment market share of new car sales, 49.1% in 2018. As of 2018[update], 10% of all passenger cars on Norwegian roads were plug-ins. Evolution of the ratio between global sales of BEVs and PHEVs from 2011 to 2018. The global stock of plug-in electric vehicles (PEVs) between 2005 and 2009 consisted exclusively of all-electric cars (BEV), totaling about 1,700 units in 2005, and almost 6,000 in 2009. The plug-in stock rose to about 12,500 units in 2010, of which 350 were plug-in hybrids (PHEVs). By comparison, during the Golden Age of the electric car at the beginning of the 20th century, the EV stock peaked at approximately 30,000 vehicles. After the introduction of the Nissan Leaf and the Chevrolet Volt in late December 2010, the first mass-production plug-in electric cars by major manufacturers, plug-in sales grew to about 50,000 units in 2011, to 125,000 in 2012, and almost 213,000 cars and utility vans in 2013. Sales totaled over 315,000 units in 2014, up 48% from 2013. In March 2014, Norway became the first country where over 1 in every 100 passenger cars on the roads was a plug-in, and, by October 2018, 1 in every 10 passenger cars registered in Norway was a plug-in. In five years, global sales of highway legal light-duty plug-in vehicles increased more than ten-fold, totaling more than 565,000 units in 2015 - an 80% increase from 2014, driven mainly by China and Europe. About 775,000 plug-in electric cars and vans were sold in 2016, and 1.22 million in 2017 - up 57% from 2016 - with China accounting for about half of global sales. The global market share of the new light-duty plug-in segment reached 1.3% in 2017, up from 0.86% in 2016, and 0.38% in 2014. Global light-duty plug-in vehicle sales passed the 3 million milestone in November 2017 and 5 million at the end 2018. Global sales totaled 2,018,247 plug-in passenger cars in 2018, up 72% from 2017, with a market share of 2.1%. The BEV:PHEV ratio rose to 69:31. 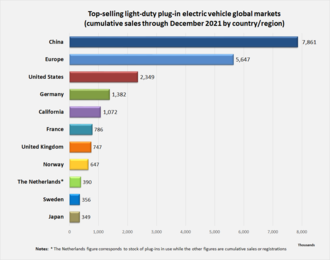 Annual sales of light-duty plug-in electric vehicles in the world's top markets between 2011 and 2017. September 2015 Cumulative global plug-in sales passed 1 million units. Global all-electric car/van sales passed 1 million. 2018 1 million plug-in electric cars sold in the U.S.
(1) Includes sales or registrations of highway legal light-duty vehicles except where noted. (2) Only includes plug-in electric passenger cars. (3) Includes registrations of used imports. (4) Kei cars are not included for the Japanese market share estimate. (6) Includes passenger plug-ins and heavy-duty commercial vehicles such as buses and trucks. (7) Market penetration is the number of plug-in passenger cars as a percentage of the stock or total number of passenger cars registered. Data for latest available year. (9) Registered plug-in stock at the end of 2018. (1) The French market share corresponds to combined sales BEV passenger cars and utility vans only (PHEVs not included). (3) Market share for the first nine months of 2018. Albania is considered one of the best countries for emissions for electric cars as it generates all of its electricity from hydroelectric power. Electric cars are currently used by the Albania Police Force. The Interior Minister claimed, that the cost of fuel per 100 kilometers(62 miles) would be less than 120 Albanian Leke (less than 1 Euro). Saytaxi is the first taxi company in Albania that offers electric vehicles and operates a fast EV(electric vehicles) charging point, and have been operating in the country since 2014. Its goal is to replace 80% of all non-electric cars with electric in the taxi business. On October 31, 2017, Tirana became one of few European countries to use electric busses when they tested a Solaris Urbino 12, with the purpose of reducing pollution. Tirana's goal is to gradually convert 10 to 20 percent of the bus fleet into electric ones. Beginning in mid-2009, a twelve-month field trial was conducted with the Mitsubishi i-MiEV with potential electric vehicle customers, such as government bodies and fleet operators. The iMiEV remained the top selling electric vehicle in Australia through 2013. The Mitsubishi Outlander P-HEV, became Australia's top selling EV in 2014 and remained the leader into 2016 with 2,015 units sold since its introduction. At the end of March 2015, Tesla Model S registrations totaled 119 in New South Wales and 54 in Victoria. Although no sales figures were reported for Tesla in other states, the combined sales of these two were enough for the Model S to rank as the top selling BEV car for the first quarter of 2015, ahead of the BMW i3 (46) and the Nissan Leaf (31). As of December 2016[update], about 1,000 Leafs had been sold since its 2012 introduction . Chargepoint is the only major operator of a charging network in Australia. Sales of electric cars rose from 97 units in 2009, to 116 in 2010, 425 in 2011, to 900 in 2012. Of the latter, only 350 units were sold to individuals. The Belgian government established purchase incentives for BEVs, ending in 2012. Hybrids were not eligible. A separate subsidy supported investments in public charging stations. Nissan Leaf operating as a taxi at Santos Dumont airport as part of a demonstrations program in Rio de Janeiro. Eco Vagas: parking spaces reserved for low emissions vehicles in Brasília. As of September 2015[update], 2,214 hybrid and electric vehicles were registered in the state of São Paulo In March 2013, the first two Leafs were deployed in Rio de Janeiro to operate as taxis. In September 2014 the BMW i3 became the first EV available for retail customers. As of June 2016[update], other retail plug-ins were the BMW i8 and the Mitsubishi Outlander P-HEV. Plug-ins and hybrids are subject to taxes adding up to more than 120% of the retail price. In May 2014 São Paulo City passed a municipal law to exempt EV, hybrids and fuel cell vehicles from the city's driving restriction scheme and purchase incentives. There were 560 electric motobikes and 520 electric cars officially registered in Bulgaria at the end of March 2018. The government does not provide grants for buying electric cars, but at least it does not apply road tax to them. Parking electric vehicles in central urban parking zones is free of charge as well. The first car sharing company in Bulgaria Spark.bg uses only electric cars, mostly E-up!s and in early 2018 had at least 60 electric vehicles and expected to have 100 at the end of the year. Courier company Speedy uses 20 electric Renault Kangoo. The Chevrolet Volt is the all-time top selling EV in Canada. Shown here is a fleet of Volts at a solar-powered charging station in Toronto. The stock of plug-in electric passenger cars in Canada totaled 45,950 units at the end of 2017, consisting of 23,620 all-electric cars and 22,330 plug-in hybrids. The market share of the plug-in segment accounted for 1.4% of all new car sales for December 2017, and 0.9% for 2017. The Chevrolet Volt was the top selling PHEV, with cumulative sales of 13,619 units through December 2017, and the Tesla Model S was the top selling BEV with 6,731 units sold as of December 2017. Purchase and other incentives for new EVs are offered by the provinces of Quebec and British Columbia. In October 2016, Quebec passed legislation that obliges major carmakers to offer an increasing number of PHEV and BEV models, beginning with 3.5% in 2018 and rising to 15.5% in 2020, using a tradable credit system. Sales of new energy vehicles in China by year between January 2011 and December 2018. China is by far the largest electric car market in the world. Domestically built new energy vehicle (NEV) sales totaled almost 3 million units between January 2011 and December 2018. These figures include heavy-duty commercial vehicles such as buses and sanitation trucks. Sales of domestically built new energy passenger cars totaled over 1.2 million units between 2011 and 2017, of which, a total of 579,000 were sold in 2017, representing about half of global plug-in car sales in 2017. Domestically-produced vehicles accounted for about 96% of total plug-in electric vehicle sales. As of December 2018[update], the NEV stock consisted of 2,369,088 all-electric vehicles (79.4%) and 641,359 plug-in hybrid vehicles (20.6%). Entry-level vehicles dominate the Chinese plug-in passenger market. The Chinese stock of plug-in electric buses was about 343,500 vehicles as of December 2016[update], of which, almost 300,000 were BEVs. The Chinese plug-in electric bus stock grew nearly sixfold over 2014, and almost doubled from 2015 to 2016. Chinese sales of domestically-built new energy vehicles in 2017 totaled 777,000 units, up 53% from 2016 consisting of 652,000 all-electric vehicles (up 59.4%) and 125,000 plug-in hybrid vehicles (up 27.6%). Sales of domestically-produced new energy passenger vehicles totaled 579,000 units, consisting of 468,000 all-electric cars and 111,000 plug-in hybrids. Accounting for foreign brands, plug-in car sales rise to about 600,000 in 2017. The plug-in segment achieved a record market share of 2.1% of new car sales. The Chinese government adopted in 2009 a plan to become one of the world leaders in producing EVs. The plan has four goals: create a world-leading industry; energy security; reduce urban air pollution; and to reduce carbon emissions. In June 2012 the State Council published a plan to develop the domestic industry. The plan set a sales target of 500,000 new EVs by 2015 and 5 million by 2020. Initial sales were much lower than expected, while most output was purchased for public fleets. New incentives were issued in 2014, with a sales target of 160,000 units for 2014. This goal was also not achieved. The Chinese government uses the term new energy vehicles (NEVs) to designate plug-ins and electrics. Only EVs are eligible for purchase incentives. The Chinese government has put forward the strategy of “Energy Saving and Electric Vehicles”. The policy measures of this strategy mainly focused on carrying out pilots to subsidize EV buyers, promoting charging facilities construction and accelerating EVs commercialization. On June 1, 2010, the government announced a trial program to provide financial incentives in five cities. A 2013 joint announcement by the National Development and Reform Commission and finance, science, and industry ministries offered a maximum of US$9,800 toward the purchase of a BEV passenger vehicle and up to US$81,600 for electric buses. In April 2016 the Traffic Management Bureau under the Ministry of Public Security announced special green license plates to facilitate preferential traffic policies. The Mitsubishi i-MiEV was the first EV in Chile. The first public quick charging station was opened in April 2011. In August 2014 Mitsubishi replaced the i-Miev with the Outlander PHEV. Later that year BMW introduced their "i" range with the i3; Renault launched their Zero Emission (Z.E.) lineup, including the Fluence Z.E. sedan, the Kangoo utility van and Zoe city car. The French brand sold 22 electric vehicles in their first month in the Chilean market. The BEV Renault Twizy quadracycle is the top selling electric vehicle in Colombia. Latin America's first BEV taxi fleet was launched at the beginning of 2013 in Bogotá. These taxis were exempted from the driving restriction scheme. The program is an effort to improve air quality and set an example. In September 2013 45 taxis were delivered. The BMW i3 was introduced in Colombia in 2014. The BEV Renault Twizy quadracycle was introduced in the Colombian market in June 2015. Sales of the Outlander P-HEV were scheduled to begin in September 2015. As of June 2015[update], 126 EVs had been sold, mostly to corporate customers. In 2013 the government established promotional incentives. These include the exemption from the driving restriction scheme in place in Colombian cities such as Bogotá and Medellín. The government exempted BEV and PHEV cars from import duties for three years, with an annual quota of 750 cars of each type. Mitsubishi i-MiEV purchased by the US embassy in Costa Rica. As of January 2015[update], the Costa Rican stock of electric drive vehicles consisted of 477 hybrid electric vehicles and 2,229 electric vehicles. Plug-in car sales totaled 108 units in 2016. The top selling model was the Outlander P-HEV with 60 units. In 2006 electric cars were exempted from the consumption tax, while conventional vehicles faced a 30% rate. In October 2012, electric cars were exempted from San José's driving restriction. EVs were exempted from import duties and the government agreed to deploy charging stations in strategic locations in San José. The first electric car to go on sale was the REVAi, introduced in March 2009. The REVAi, powered by lead–acid batteries, sold 10 units. The Mitsubishi i MiEV was launched in February 2011, with initial availability of 25 to 50 units. As of December 2016[update], 2067 electric cars had been sold in Croatia. Of these, 224 were EVs, while the rest were hybrids. As of September 2017[update], 201 free public charging stations operated in Croatia. As of December 2015[update], around 4,000 electric cars had been sold in Denmark. Denmark was the second largest European market for light-duty, plug-in commercial vehicles or utility vans, with over 2,600 plug-in vans sold that year, representing 8.5% of all vans sold . Most vans were plug-in hybrids, accounting for almost all EU plug-in van sales. After the expiration of the government incentives, sales drop to about 1,300 all-electric cars in 2016, and fell further in 2017 to almost 700 pure electric cars. As of December 2017[update], the stock of registered all-electric cars amounted to 8,746 units, slightly up from 8,643 electric cars in 2016. Sales of plug-in hybrids grew from 5 sold in 2013 to 572 in 2016, and 621 units in 2017. Denmark's sales surged before the expiration of its purchase incentives, and plunged thereafter, its plug-in market penetration plunge to 0.1% as of July 2017[update]. In April 2017 the government announced a partial resumption of the credit, while adding a new fund for fuel cell vehicles. Two Mitsubishi i-MiEVs in Estonia. The majority of electric cars in Estonia are i-MiEVs. As of February 2015[update], 1,188 plug-in vehicles were registered. Estonia was the first country to deploy an EV charging network with nationwide coverage, with fast chargers available along highways at a maximum distance of 40 to 60 km (25 to 37 mi). As of December 2012[update], the nationwide network consisted of 165 fast chargers. In 2011, the government confirmed the sale to Mitsubishi of 10 million carbon dioxide credits in exchange for 507 i-MiEV electric cars. The deal included funding 250 fast charging stations and subsidies for the first 500 private buyers of any electric approved by the EU. The first 50 i-MiEVs were delivered in October 2011, for use by municipal social workers. Estonia's figures are low compared to other advanced economies, attributed to lack of government incentives after the carbon credit scheme was exhausted. As of October 2016[update], about 2,250 EVs were registered. Sales reached 854 in the first three quarters of 2016. Plug-in sales were slowed over range concerns and high plug-in prices. In November 2016, the government set the goal of 250,000 plug-in cars and 50,000 biogas cars on the road by 2030. These goals are part of the Finnish government efforts to comply with the 2015 Paris Agreement. Many companies in Finland are involved in next-generation vehicle manufacturing, including Valmet Automotive (Fisker Karma and Garia A/S electric golf cart production) Fortum (concept cars and infrastructure), Kabus (hybrid buses; part of Koiviston Auto Oy), BRP Finland (part of Bombardier Recreational Products), Lynx (snowmobile), Patria (military vehicles), European Batteries (Li-ion battery plant in Varkaus), Finnish Electric Vehicles (battery control systems), ABB, Efore, Vacon (electric motor technology production), Ensto (production of charging units), Elcat (electric vehicle production since the 1980s), production of electric car accessories, Suomen Sähköauto Oy (produces small electric cars), Oy AMC Motors Ltd. (produces and designs small electric cars), Raceabout (specialist electric sport car with very few sales), Gemoto skooters from Cabotec, Resonate's Gemini and Janus Scooters, Moto Bella Oy, Axcomotors, Randax and Visedo. Research related to electric cars is in progress at the VTT Technical Research Centre of Finland and Tekes. Electric car organisations in Finland include the Electric Vehicle Association of Finland[permanent dead link] and Electric Vehicles Finland. A non-commercial electric car conversion organisation is called Electric Cars - Now! that converts Toyota Corollas into Li-ion battery-powered electric cars. Basic charging infrastructure is available all over Finland, used for winter engine pre-warming. Because of its climate – cold winters and warm summers – Finland is considered a convenient "test laboratory" for electric cars. Registration of light-duty plug-in vehicles in France by type of vehicle between 2010 and 2018. The stock of light-duty plug-in electric vehicles registered in France passed the 100,000 unit milestone in October 2016, making the country the second largest plug-in market in Europe after Norway. It ranked also as the world's fifth largest plug-in market after the U.S., China, Japan and Norway. As of December 2017[update], a total of 149,797 light-duty plug-in electric vehicles have been registered in France since 2010. The plug-in electric stock consisted of 92,256 all-electric passenger cars, 25,269 all-electric utility vans, and 32,272 plug-in hybrids. The plug-in passenger car segment achieved a record market share of 1.98% of new car registrations in 2017. France was the largest European market for light-duty electric commercial vehicles or utility vans in 2016. The Renault Zoe has led electric car sales in France since 2013, and is the country's all-time best selling plug-in with almost 50,000 units registered through December 2016. Plug-in electric car registrations have been led by the Renault Zoe for five years running since 2013, with 5,511 in 2013, 5,970 in 2014, 10,406 in 2015, 11,402 in 2016 and with 15,245 units in 2017, totaling 48,582 units since 2012. The electric utility van segment has been led by the Renault Kangoo Z.E. with over 15,000 units sold through September 2016. In 2008 France established a bonus-malus system offering a purchase incentive for low emission cars and a penalty fee (malus), for the purchase of high-emission vehicles. 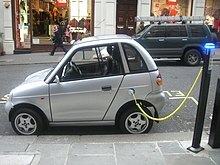 In 2015 the government introduced an additional bonus for all-electric car purchasers who scrapped a diesel-powered car in circulation before 1 January 2001. As of September 2016[update], the scrappage bonus had been granted for more than 10,000 purchases. Annual registration of plug-in cars in Germany by type of vehicle between 2010 and 2018. As of December 2018[update], a total of 196,750 plug-in electric cars have been registered in Germany since 2010. The country is Europe's largest passenger car market, but ranks only fifth in plug-in car sales in 2016. About 93% of the plug-ins registered through December 2018 were registered since 2014. In 2013 Germany reclassified range-extended vehicles as series plug-in hybrids instead of all-electric vehicles. As a result, the registrations figures for 2012 and older do not account for plug-in hybrids. As of November 2014[update], the country had 4,800 public charging stations. A record of 54,492 plug-in cars were registered in 2017, up 217% the previous year, and consisting of 29,436 plug-in hybrids and 25,056 all-electric cars. Registrations rose to 67,504 units in 2018. The plug-in market share was 1.58% in 2017 and 1.9% in 2018. The top selling models in 2017 were the Audi A3 e-tron (4,454), Renault Zoe (4,322), and BMW i3 (4,319). The Smart electric drive led the plug-in electric car segment in Germany until 2013. Under its National Plattform for Electric Mobility, Chancellor Angela Merkel in 2010 set the goal of putting one million electric vehicles on German roads by 2020. Initially, the government did not provide subsidies in favor of research. The Bundestag passed the Electric Mobility Act in March 2015 that authorized local government to grant non-monetary incentives. The measures privilege battery-powered cars, fuel cell vehicles and some PHEVs, by granting local governments the authority to offer additional incentives. The introduction of the purchase bonus noticeably impacted sales only in September 2016, when registrations grew to 3,061 units. An incentive scheme was approved in April 2016 including purchase subsidies, charging stations and another federal government fleet purchases, with a target of 400,000 electric vehicles. Premium cars, such as the Tesla Model S and BMW i8, were not eligible. As of September 2016[update], BMW, Citroën, Daimler, Ford, Hyundai, Kia, Mitsubishi, Nissan, Peugeot, Renault, Toyota, Volkswagen, and Volvo had signed up to participate in the scheme. The online application system to claim the bonus went into effect on 2 July 2016. As of December 2017, 10,666 plug in vehicles were registered in Hong Kong. March 2017 saw 2,964 EV's registered in one month before first registration tax exemption was repealed. 2,939 of these cars were Tesla Model S and X.
Tesla Roadster charging at Central Star Ferry carpark in Hong Kong. As of September 2016[update], 6,298 plug-in vehicles were on the roads in Hong Kong, up from 3,253 in October 2015. The plug-in segment market share achieved 4.8% of new car sales in Hong Kong in 2015. As of October 2015[update], more than 1,200 public electric vehicle charging points were available. More than a dozen models were available for retail customers. Sales of electric cars took off in Hong Kong with the Tesla Model S in 2014. The tax waiver made the Model S competitive in the luxury car segment, at about half the price of other high-end models. According to Tesla, as of September 2016[update], Hong Kong had the world's highest density of Tesla superchargers, giving most Model S owners a supercharger within a 20-minute drive. The Government offered purchase incentives to consumers, businesses and service providers were available from 2011 to 2017. The Government further allocated HK$180 million for bus companies to purchase 36 electric buses. In November, 2018 8,482 PEVs were registered in Hungary. The Hungarian government introduced its e-mobility plan in March, 2014. The Jedlik plan supported the domestic production of electric vehicles, expanding the necessary infrastructure and promoting the purchase of EVs with public incentives, including 1,5 million HUF, initiated at the end of 2016. The plug-in car segment in Iceland reached 5.37% of all new vehicles registered in 2016, allowing the country to rank second in Europe after Norway that year. Registrations of new plug-in electric cars totaled 2,990 units in 2017, up 157% from the previous year. The segment's market share achieved a record 14%, globally, second only to Norway. The top selling plug-ins in 2017 were the Mitsubishi Outlander PHEV with 884 units and the Nissan Leaf with 524. As of 2017[update], Orka Náttúrunnar (ON) was working to complete a network of 50 kW CCS Combo/CHAdeMO stations along the Ring Road. Iceland remains the only major EV market without a Tesla Supercharger network. As of December 2015[update], over 6,000 plug-in cars were registered, consisting of 4,350 BEV cars and 1,660 PHEVs. The Indian government has FAME schemes and Lower GST on EVs to encourage electric vehicles. [clarification needed] Tata also launch electric buses to Himachal Pradesh road transport corporation The Mahindra Reva e2o electric car was introduced in March 2013. It operates on lithium ion batteries with 100 km range for 4 hours of charging. In 2016, a new car, the Mahindra e-Verito, introduced a sedan class Ev at a cost of 9 to 10 lakh Indian rupees ex showroom. Revised and new variants(P6, P8) of e2o, now called e2o plus offer increased ranges of up to 140 km on full charge. The government supported some trial models made by Tucuxi. Conversion of some vehicles to electric drivetrains was introduced during the APEC Meeting in October 2013. Sales of electric cars in Ireland increased more than four times in 2014 from a low base. The government committed to making 10% of all vehicles by 2020 (a projected 230,000 vehicles). Government officials reached agreements with French car maker Renault and its partner Nissan. As of September 2014[update], purchase incentives became available. BMW i3 patrol car of the Italian police at Vatican City. As of December 2015[update] over 6,100 plug-in cars were registered, consisting of 4,580 BEV cars and 1,550 PHEVs. The top EV in 2015 was the Nissan Leaf (390 units sold). About 10,000 electric vehicles were sold in Italy in 2018, double the 2017 number of about 5,000. The government discontinued incentives in 2014 amid a limited public charging infrastructure and tepid reception. Further, many Italian houses were equipped with electric contracts allowing only 3 kW of peak consumption, making home charging of electric cars impractical. As of December 2016[update], the Nissan Leaf is the all-time top selling plug-in car in Japan, with 72,494 units sold since December 2010. As of December 2017[update], Japan had a stock of light-duty plug-in vehicles of 205,350. Sales totaled 24,660 units in 2015, and 24,851 units in 2016. The segment market share declined from 0.68% in 2014 to 0.59% in 2016. Declining sales growth reflected the governmental and domestic carmaker decision to promote hydrogen fuel cell vehicles instead. Sales recovered in 2017, with almost 56,000 plug-in cars sold, and the segment's market share reached 1.1%. In May 2009 the Japanese Diet passed the "Green Vehicle Purchasing Promotion Measure". The program provided purchasing subsidies for cars, mini and keis, trucks and buses, including an extra subsidy for purchases trading in a sufficiently old used car. The program ended on March 31, 2010. The Japanese electric vehicle charging infrastructure climbed from 60 public stations in 2010 to 1,381 in 2012. The Mitsubishi Outlander P-HEV was the top selling EV in Japan in 2015. Mitsubishi introduced multiple plug-in vehicles: the Mitsubishi i MiEV in 2009, the Mitsubishi Minicab MiEV in 2011, a truck version of the Minicab MiEV and the Mitsubishi Outlander P-HEV in 2013. As of December 2014[update], Mitsubishi had sold 36,386 light-duty plug-ins. The Nissan Leaf launched in 2010. The Toyota Prius PHEV launched in January 2012, selling 19,100 units through September 2014. Tesla Model S deliveries began in September 2014. Leaf sales in 2016 were 14,795 units. Nissan had sold 72,494 units cumulatively through 2016, making the Leaf Japan's all-time best-selling plug-in car. Sales of the Outlander PHEV fell sharply from April 2016 as a result of Mitsubishi's fuel mileage scandal. Sales totaled 34,830 units through August 2016. There have not been much effort in by Kosovo of using Plug-in electric vehicles. However ProCredit Bank, Kosova, became the first institution in Kosovo to use electric vehicles, by buying 10 new Mitsubishi i-MiEV vehicles. In 2017, six teens in the city Gjakova, from BONEVET makerspace, became the first European teenager group to build an electric car out of a Renault Twingo, transforming it from a petrol-fuelled car to a fully functional electric car. A Nissan Leaf charging at a public charge station in Colonia Condesa, Mexico City. In October 2009 Nissan reached an agreement with the Mexico City government, purchasing 500 Leafs for use of government and corporate fleets. In exchange, recharging infrastructure was to be deployed by the city government. The first 100 Leafs (destined for the taxi fleet) were delivered in 2011. As of February 2013[update], about 70 Leafs were deployed as taxis, 50 in Aguascalientes and 20 in Mexico City. Retail Leaf sales began in June 2014. Retail deliveries of the BMW i3 began 2014. The second generation Volt and Tesla Model S began in 2015. As of October 2012[update], no government purchase incentives were available. However, electric cars are exempted from Mexico City's driving restriction scheme. Number of registered plug-in electric vehicles on the road in the Netherlands from 2011 to 2018. As of 31 December 2017[update], there were 121,542 highway legal light-duty plug-in electric vehicles registered in the Netherlands, consisting of 98,217 range-extended and plug-in hybrids, 21,115 pure electric cars, and 2,210 all-electric light utility vans. When buses, trucks, motorcycles, quadricycles and tricycles are accounted for, the Dutch plug-in electric-drive fleet climbs to 123,499 units. The country's electric vehicle stock reaches 165,886 units when fuel cell electric vehicles (43), mopeds (4,376), electric bicycles (37,652), and microcars (316) are accounted for. The market was dominated by plug-in hybrids representing 80.8% of the country's stock of passenger plug-in electric cars and vans registered at the end of December 2017. Plug-in car sales fell sharply during 2016 after changes in the tax rules. Sales during the first half of 2016 were down 64% from the same period in 2015. The plug-in market share declined from 9.9% in 2015, to 6.7% in 2016, and fell to 2.6% in 2017. As of December 2016[update] the Mitsubishi Outlander P-HEV is the all-time top selling plug-in car in the Netherlands with 25,984 units registered. A total of 42,367 plug-in cars were sold in 2015. The top 5 were all plug-in hybrids, led by the Mitsubishi Outlander PHEV. The Tesla Model S continued as the top selling electric car with 1,842 units. A total of 9,185 passenger plug-ins were registered in the first three quarters of 2016. As of December 2016[update] the Outlander P-HEV was the top-selling plug-in car with 25,984 units, followed by the Volvo V60 PHEV (15,804), Volkswagen Golf GTE (10,691), Volkswagen Passat GTE (7,773), Mercedes-Benz C 350 e (6,226), and the Tesla Model S (6,049). The Tesla Model S, released in the Dutch market in September 2013, is the country's top selling BEV car ever. 2 emissions do not exceed 50 g/km. The rate for a conventional internal combustion car is 25% of its book value. The Dutch government set a target of 15,000 electric vehicles in 2015, 200,000 in 2020 and 1 million in 2025. The government exempted selected vehicles from registration fee and road taxes. The exemption from the registration tax ended in 2013. Battery electric vehicles have special access to parking spaces in Amsterdam, queues for which can otherwise reach up to 10 years. Free charging is offered in public parking spaces. Other factors contributing to the rapid adoption of plug-in electric vehicles are the Netherlands' small size, which reduces range anxiety; a long tradition of environmental activism; high gasoline prices (US$8.50 per gallon as of January 2013); and some EV leasing programs that provide free or discounted gasoline-powered vehicles for covering long distances. As of September 2018[update], about 10,200 light-duty EVs were registered. The majority of the fleet (5,700) consists of used imports from Japan and the UK. The most popular model by far is the Nissan Leaf, with 5,200 registered. The New Zealand Government launched an Electric Vehicle Programme in May 2016, in order to encourage EV uptake. Electric vehicles in New Zealand are exempt from road user charges until at least 31 December 2021, and pay the lower petrol rates for ACC levies on motor vehicle licensing. Registration of EVs in Norway by year between 2004 and 2018. Includes PHEVs and BEV cars and vans. Used imports are included. Distribution of the Norwegian stock of passenger cars by type of fuel or powertrain at the end of March 2019. The stock of light-duty plug-in electric vehicles registered in Norway totaled 296,214 units at the end of December 2018, consisting of 200,192 all-electric passenger cars and vans, and 96,022 plug-in hybrids, including a significant number of used imports from neighboring countries. Norway's fleet of electric cars is one of the world's cleanest, because 99% of its power comes from hydropower. Norway has the world's largest EV ownership per capita, with 21.5 plug-ins per 1,000 people as of July 2016. The plug-in electric passenger car segment captured a market share of 29.1% in 2016, rose to 39.2% in 2017, and achieved a 49.1% in 2018, meaning that every second new passenger car sold in Norway in 2018 was a plug-in electric. In January 2017 the electric-drive segment surpassed combined conventional internal combustion engine sales for the first time ever, achieving a combined market share of 51.4% of new car sales. In October 2018, Norway became the first country where 1 in every 10 passenger cars registered is a plug-in electric vehicle. Norway was the first country in the world to have all-electric cars top the new car sales monthly ranking. The Tesla Model S has been the top-selling new car four times, and the Nissan Leaf twice. As of March 2018[update], the Mitsubishi Outlander P-HEV remained as the top selling plug-in hybrid with 14,196 new units sold. The Nissan Leaf continued to be the most popular model in the plug-in segment with 50,000 units registered by early December 2018, including used imports from neighboring countries, and representing 25% of total all-electric car registrations in Norway. The Norwegian government set a series of incentives to promote the adoption of zero emission vehicles (ZEVs). Electric vehicles are exempt from all non-recurring vehicle fees, making electric cars price competitive with conventional cars. BEVs are exempt from the annual road tax, public parking fees and toll payments (including domestic ferries), as well as given access to bus lanes. Plug-in hybrids have a smaller market share than ZEVs because they are not eligible for the same incentives. In 2013 the government reduced taxes for to improve PHEV sales. The initial 50,000 vehicle target was reached on 20 April 2015 at a cost of up to 4 billion krone (around US$640 million). The Government decided to continue the incentives through 2017, although the Parliament phased out some of the incentives. As of January 2018[update], 24 out of 58 major municipalities kept the free parking for EVs. Among the 34 municipalities that terminated the benefit, six kept different variants of partial free parking. In 2016, the government proposed its National Transport Plan 2018-2029 (NTP) with the goal that all new cars, buses and light commercial vehicles in 2025 should be zero emission vehicles. By 2030, heavy-duty vans, 75% of new long-distance buses, and 50% of new trucks must be zero emission vehicles. Dynasty IT was bought by Karakoram Motors of Pakistan, and now it is manufactured in Pakistan. Pakistan already has a significant market for hybrid vehicles with Honda's Vezel, Toyota's Prius and Aqua, and other models seen on the roads. The Automotive Development Policy (2016-2021) and the launch of China-Pakistan Economic Corridor (CPEC) are encouraging foreign investments for the new automobile brands to enter Pakistani market, while the leading manufacturers in the automobile industry in Pakistan are now introducing EV models with a wide range of prices which target consumers of diverse income groups. Several members of the international automobile industry including South Korea, China, and Japan also believe that Pakistan has a high potential market for EV technology, and local businesses are collaborating with them to bring EVs in Pakistan. In January 2017, Dewan Motors with BMW inaugurated Pakistan's first public charging station for electric and plug-in hybrid electric vehicles in Emporium Mall, Lahore. Dewan Motors had installed another station for plug-in hybrid and electric vehicles at Dolmen Mall in Karachi in February 2017. In 2017, Jolta International had created the first locally manufactured electric motorcycle. The company is based just outside of Bahria Town Rawalpindi, and showcased three Jolta Chargeable Electrical Motorcycles in Gwadar. Leading automobile manufacturers, including Super Power Motorcycles, have started introducing EV models, while Neon, a Pakistan-based motorcycle assembler, has introduced an all electric Neon M3 motorbike in Pakistan. The macho looking sports bike comes with emission free and noiseless features. Neon also assembles Electric scooters in Pakistan. The country's first electric was launched at Silliman University by Insular Technologies in August 2007. In some major cities such as Makati, electric Jeepneys are used as well as electric tricycles (rickshaws). The Eagle G-Car is a Philippine BEV car (at a cost as low as $3,000-$6,000). E-Jeepneys were a venture of Renewable Independent Power Producer Inc., which sprang from Greenpeace and other groups, and Solarco, which in turn is a part of GRIPP. During a demonstration at Nanyang Technological University on February 7, 2018, Nissan Philippines' president and managing director Ramesh Narasimhan has announced that they would like to bring the Leaf to the Filipino market. A Mitsubishi i-MiEV charging at an e+ charging station. e+ is a Polish provider of electric cars and infrastructure. In 2009 Poland began developing charging station infrastructure in Gdańsk, Katowice, Kraków, Mielec and Warsaw with EU funds. In November 2017 an electric car sharing network opened in Wrocław. The fleet is based on 2013 model of Nissan Leaf. 4) batteries and brushless DC electric motors. In 2015 the stock of EVs reached about 2,000, consisting of 1,280 BEV cars and 720 PHEVs. EV sales totaled 1,305 units in 2015, up 260% from 2014. The top selling model was the Mitsubishi Outlander P-HEV (229). In 2009 Portugal worked with Renault and Nissan to create a national charging network. In 2010 the government offered purchase incentives for the first 5,000 EVs and a separate scrappage incentive. EVs were exempted from the vehicle registration tax. These incentives were discontinued at the end of 2011. As of January 2019[update] over 1,500 EVs were registered. Registrations were led by the BMW i3. The government offered purchase incentives. As of July 2016[update] 722 EVs were registered. Registrations were led by the Mitsubishi i-MiEV. As of October 2016[update], 129 EVs were registered. BMW was the EV segment leader. Adoption was slowed by high purchase prices, lack of public charging infrastructure and unclear national policies. As of October 2016[update], 74 public charging stations were operating. The government offered purchase incentives, although the country's taxation scheme made EVs more expensive than a conventional car. EVs face a carbon surcharge and a scrap rebate, along with the annual road tax. As of December 2015[update], about 290 plug-in cars were registered, all in 2015. The Nissan Leaf was introduced in October 2013. As of January 2018[update], this number has increased to 375, 0.2% of all registered vehicles. GridCars is a Pretoria-based company promoting Commuter Cars, based on the TREV from Australia. The concept is to build ultra-light EVs, lessening demand on battery requirements, and making the vehicle more affordable. The Joule, designed by Cape Town-based failed start-up Optimal Energy, was announced at the 2008 Paris Motor Show, with a maximum range of 300 km (190 mi). The country has a 45% tax on electric vehicles which discourages their import,. New internal combustion engine vehicles face a surcharge based on engine capacity. As of October 2016[update], about 7,200 plug-in cars had been sold. 2,896 EVs were sold during the first ten months of 2016, up 12% year-on-year. As of 2014[update], all electric models on sale were manufactured by local firms. The top selling models during 2015 were the Kia Soul EV (657) and the Samsung SM3 Z.E. (640). The Hyundai Ioniq Electric was released in July 2016. The government offers a purchase subsidy for electric cars. Starting in 2016, the EV purchase tax surcharge was reduced, although EV drivers see various fees. 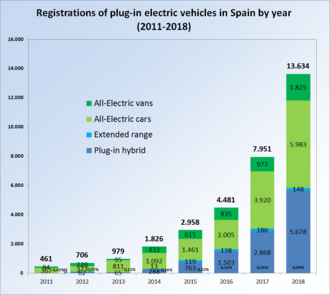 EV registrations in Spain by year between 2010 and 2017. The stock of plug-in cars reached almost 6,000 plug-in as of 2015, consisting of 4,460 BEV cars and 1,490 PHEVs. The top selling model in 2015 was the Mitsubishi Outlander P-HEV (389). 3,129 EVs were sold in Spain during the first three quarters of 2016. Sales continued to grow at an accelerated pace, up 79% from the same period in 2015. In 2011 the national government initiated EV purchase incentives. Aragón, Asturias, Baleares, Madrid, Navarra, Valencia, Castilla-La Mancha, Murcia, Castile and León offered additional incentives. As of September 2015[update], 2,072 electric cars had been registered, led by the Nissan Leaf. EV sales experienced a record month in September 2015 with 471 units registered, up from only 15 in September 2014. Sales of the Nissan Leaf began in 2013. No government incentives promote EVs. Electric vehicle tax increased from 5% to 50% through the new government's Interim Budget. EV registrations in Sweden by year between 2011 and 2018. As of December 2017[update], a total of 50,304 light-duty plug-in vehicles have been registered since 2011, consisting of 36,405 plug-in hybrids, 12,223 all-electric cars, and 1,676 all-electric vans. The market is dominated by plug-in hybrids, representing 74.9% of plug-in car registrations through 2017. Passenger plug-ins increased their market share to 3.5% in 2016, and achieved a record of 5.2% in 2017. As of December 2017[update], the Outlander PHEV continues to rank as the all-time top selling plug-in electric car with 9,957 units registered. As of December 2016[update], the Renault Kangoo Z.E. continued as the all-time the leader in the commercial utility EV segment with 1,024 units. Effective January 2012 Sweden offered subsidies for the purchase and operation of 5,000 electric cars and other "super green cars" with low/no carbon emissions. The program was belatedly renewed through 2015 and again for 2016 with the addition of subsidies for electric buses. As of April 2016[update], over 12,000 EVs had been registered since 2012. During the first quarter of 2016, 1,479 EV were registered, consisting of 773 BEV cars (up 37.5% from 1Q 2015), and 706 PHEVs (up 44.1% from 1Q 2015). Registrations of plug-in cars totaled 6,288 units in 2015, up 133.9% from 2,668 in 2014. Deliveries of the Mitsubishi i MiEV. the Nissan Leaf were launched in 2011. The government offers no subsidies or incentives for purchasing EVs. Cantons can propose special discounts on annual taxes depending on the car's efficiency label and range from 100% rebate (e.g. Solothurn) to 0%. Taiwan has a plan to ban all non-electric vehicles in the coming decades, due to concerns over air quality. The plan calls for all new government vehicles and public buses to be electric by 2030, ban sales of nonelectric motorcycles by 2035, and ban sales of nonelectric four-wheel vehicles by 2040. As of 1 January 2019[update], a total of 19,884 plug-in cars and conventional hybrids are registered in Ukraine, consisting of 10,714 plug-ins and 9,170 hybrids. Over the year 2018, the number of electric vehicles increased by 73% (5,557 cars). The EV market share of total new and used cars first registered during 2018 was 2.8% based on 5,557 out of a total of 198,600 first registered cars. The Ukrainian Government passed a 2019 budget law which extended existing 2018 tax privileges for plug-in cars until 2023. Both new and second hand plug-in BEVs ( without gasoline range extenders) may be imported free of VAT, import duty and excise duty. As a consequence of the law, new cars like for example the Tesla Model 3 can be purchased for a lower price than in any other country in Europe. This has stimulated demand in 2018 and the trend will most likely continue through 2019. In November 2018 EV imports were almost 250% those of November 2017. Registration of EVs in the UK between January 2011 and December 2018. The REVAi/G-Wiz i electric car charging at an on-street station in London. More than 212,000 light-duty plug-in electric vehicles had been registered in the UK up until December 2018, including about 10,000 plug-in commercial vans. As of 18 January 2018[update], the UK had 19,108 public charging points at 6,703 locations, of which 4,391 were rapid charging points at 1,332 locations. A surge in plug-in car sales took place beginning in 2014. Total registrations went from 3,586 in 2013, to 37,092 in 2016, and rose to 59,911 in 2018. The market share of the plug-in segment went from 0.16% in 2013 to 0.59% in 2014, and achieved 2.6% in 2018. As of September 2018[update], the Mitsubishi Outlander P-HEV is the all-time top selling plug-in car in the UK almost 37,000 units registered, followed by the all-electric Nissan Leaf nearly 24,000 units. The government offered purchase incentives via the Plug-in Car Grant program beginning in 2011. The program was extended to include vans in February 2012 and in October 2016 to include large electric trucks. As of September 2018[update], a total of 176,962 eligible cars have benefited with the subsidy since the launch of the Plug-in Car Grant in 2011, and, as of September 2018[update], the number of claims made through the Plug-in Van Grant scheme totaled 5,218 units since the launch of the programme in 2012. In April 2014 and December 2015, the government extended the program with modifications. Eligible ultra-low emission vehicles (ULEVs) included hydrogen fuel cell cars. 2 and have a minimum 20 mile zero emission range. A further phase from October 2021 will mean that only zero-emission vehicles (pure electric vehicles and hydrogen fuel cell vehicles) will qualify for the discount, which will be phased out completely from December 2025. U.S. annual sales of plug-in passenger cars between December 2010 and December 2018. Since the market launch of the Tesla Roadster in 2008, cumulative sales of highway legal plug-in electric passenger cars in the U.S. achieved the one million unit milestone in September 2018. The 250,000 unit mark was reached in August 2014, and the 500,000 milestone in August 2016. California is the largest plug-in regional market in the country, with 537,208 plug-in cars sold up until 2018, representing almost half of national sales. The other nine states that follow California's Zero Emission Vehicle (ZEV) regulations accounted for another 10%. The Tesla Model S (front) was the U.S. best selling plug-in car from 2015 to 2017, and the Tesla Model 3 (back) led sales in 2018. A total 157,181 plug-in cars were sold nationwide in 2016, sales rose to 199,818 in 2017, and achieved a record sales volume of 361,307 units in 2018. The plug-in segment had a market share of 1.13% in 2017, up from 0.90% in 2016, and rose to 2.1% in 2018. As of December 2018[update], the Chevrolet Volt plug-in hybrid continued to rank as the all-time best selling plug-in electric car with 152,144 units of both generations, followed by the Tesla Model S all-electric car with about 143,892, and the Tesla Model 3 with 141,546. The Model S was the best selling plug-in car in the U.S. for three consecutive years, from 2015 to 2017, and the Model 3 topped sales in 2018. California established a program to reduce air pollution in the 1980s. Under pressure from manufacturers, the program was revised to offer only modest support of zero-emission vehicles to promote research and development, and greater support for partial zero-emissions vehicles (PZEVs). Many manufacturers then terminated their electric car programs. The federal tax credit for new plug-in electric vehicles (PEVs) is worth between US$2,500 and US$7,500 depending on battery capacity. Several states have established additional incentives. ^ a b c d e f g h i j k Cobb, Jeff (2017-01-16). "The World Just Bought Its Two-Millionth Plug-in Car". HybridCars.com. Retrieved 2017-01-17. An estimated 2,032,000 highway-legal plug-in passenger cars and vans have been sold worldwide at the end of 2016. The top selling markets are China (645,708 new energy cars, including imports), Europe (638,000 EVs), and the United States (570,187 plug-in cars). The top European country markets are Norway (135,276), the Netherlands (113,636), France (108,065), and the UK (91,000). Total Chinese sales of domestically produced new energy vehicles, including buses and truck, totaled 951,447 vehicles. China was the top selling EV market in 2016, and also has the world's largest stock of plug-in cars. ^ a b c d e f g h International Energy Agency (IEA), Clean Energy Ministerial, and Electric Vehicles Initiative (EVI) (June 2017). "Global EV Outlook 2017: Two million and counting" (PDF). IEA Publications. Retrieved 2018-01-20. CS1 maint: Multiple names: authors list (link) See pp. 5–7, 12–22, 27–28, and Statistical annex, pp. 49–51. ^ a b Coren, Michael J. (2019-01-25). "E-nough? Automakers may have completely overestimated how many people want electric cars". Quartz. Retrieved 2019-01-25. The plug-in electric car segment represented just about 1 out of every 250 vehicles on the world's roads by the end of 2018 A rate of 1/250 translates into 0.40% of all vehicles on the world's roads. ^ a b c Vaughan, Adam (2017-12-25). "Electric and plug-in hybrid cars whiz past 3m mark worldwide". The Guardian. Retrieved 2018-01-20. "The number of fully electric and plug-in hybrid cars on the world’s roads passed the 3 million mark in November 2017." ^ a b c d e f g Jose, Pontes (2019-01-31). "Global Top 20 - December 2018". EVSales.com. Retrieved 2019-01-31. "Global sales totaled 2,018,247 plug-in passenger cars in 2018, with a BEV:PHEV ratio of 69:31, and a market share of 2.1%. The world's top selling plug-in car was the Tesla Model 3, and Tesla was the top selling manufacturer of plug-in passenger cars in 2018." ^ a b Staff (February 2017). "Global Plug-in Sales for 2016". EV-Volumes.com. Retrieved 2017-02-05. ^ a b c d e Staff (January 2018). "Global Plug-in Sales for 2017-Q4 and the Full Year (prelim.)". EVvolumes.com. Retrieved 2018-02-17. Global registrations totaled around 1.2 million units in 2017, 57 % higher than 2016. These include all global BEV and PHEV passenger cars sales, light trucks in USA/Canada and light commercial vehicle in Europe. In 2017, 66 % of sales were pure electric (BEV) and 34 % were plug-in hybrids (PHEV). The segment market share was 1.3%, and in December the global plug-in share touched the 2 % mark for the first time. ^ a b Hertzke, Patrick; Müller, Nicolai; Schenk, Stephanie; Wu, Ting (May 2018). "The global electric-vehicle market is amped up and on the rise". McKinsey & Company. Retrieved 2019-01-27. See Exhibit 1: Global electric-vehicle sales, 2010-17. ^ a b Automotive News China (2018-10-23). "China's electrified vehicle fleet tops 2.21 million". Automotive News China. Retrieved 2018-10-21. China’s fleet of electric vehicles and plug-in hybrids topped 2.21 million by the end of September as sales of electrified vehicles continued to surge in the country. Of the total, EVs accounted for 1.78 million, or nearly 81 percent. The rest were plug-in hybrids, China’s Ministry of Public Security said this week. Electrified cargo vehicles -- which include trucks, pickups and delivery vans -- approached 254,000, representing 11 percent of the electrified vehicle fleet as of last month. ^ a b c Kane, Mark (2018-10-06). "Plug-In Electric Cars Sales In U.S. Surpass 1 Million". InsideEVs.com. Retrieved 2018-10-23. ^ a b "Veloz: 2018 banner year for EV sales in California; up 84% from 2017; 312% increase from January to December". VELOZ. Green Car Congress. 2019-01-14. Retrieved 2019-01-23. Cumulative sales in California totaled 537,208 units between 2011 and 2018. ^ a b "Electric cars exceed 1m in Europe as sales soar by more than 40%". The Guardian. 2018-08-26. Retrieved 2018-10-23. ^ a b c d Norsk Elbilforening (Norwegian Electric Vehicle Association) (January 2019). "Norwegian EV market". Norsk Elbilforening. Retrieved 2019-01-10. Place the pointing device over the graph to show the cumulative number of electric vehicles and plug-in hybrids in Norway at the end of each year. As of 31 December 2018[update], the registered light-duty plug-in electric stock totaled 296,214 units, consisting of 200,192 battery electric vehicles and 96,022 plug-in hybrids. ^ a b c d e f g Cobb, Jeff (2017-01-17). "Top 10 Plug-in Vehicle Adopting Countries of 2016". HybridCars.com. Retrieved 2017-01-23. ^ a b c d e Norwegian Road Federation (OFV) (2019-01-02). "Bilsalget i 2018" [Car sales in 2018] (in Norwegian). OFV. Retrieved 2019-01-04. ^ a b c d Kane, Mark (2018-10-07). "10% Of Norway's Passenger Vehicles Are Plug Ins". InsideEVs.com. Retrieved 2018-11-07. ^ a b c d e f g h i j International Energy Agency (IEA), Clean Energy Ministerial, and Electric Vehicles Initiative (EVI) (May 2016). "Global EV Outlook 2016: Beyond one million electric cars" (PDF). IEA Publications. Retrieved 2016-08-24. CS1 maint: Multiple names: authors list (link) See pp. 4-5, and 24-25 and Statistical annex, pp. 34-37. ^ Clark, Pilita; Campbell, Peter (2016-08-31). "Motor Industry: Pressure on the Pump". Financial Times. Retrieved 2016-09-30. ^ Justin Gerdes (2012-05-11). "The Global Electric Vehicle Movement: Best Practices From 16 Cities". Forbes. Retrieved 2014-10-20. ^ a b c d Argonne National Laboratory, United States Department of Energy (2016-03-28). "Fact#918: March 28, 2016 - Global Plug-in Light Vehicles Sales Increased By About 80% in 2015". Office of Energy Efficiency & Renewable Energy. Retrieved 2016-03-29. ^ a b Klippenstein, Matthew (2014-04-08). "One Percent Of Norway's Cars Are Already plug-ins". Green Car Reports. Retrieved 2016-10-31. ^ a b c d e f g h Jose Pontes (2018-01-18). "China December 2017". EV Sales. Retrieved 2018-01-19. Sales of plug-in electric cars in China, including imports, totaled 600,174 units in 2017. The Chinese plug-in car market represented roughly half of the 1.2 million plug-ins sold worldwide in 2017. ^ a b c Jose, Pontes (2018-01-29). "World Top 20 December 2017 (Updated)". EVSales.com. Retrieved 2018-02-17. "Global sales totaled 1,224,103 plug-in cars in 2017, with a market share of over 1%." ^ Quiroga, Tony (August 2009). "Driving the Future". Car and Driver. Hachette Filipacchi Media U.S., Inc. p. 52. ^ Sherry Boschert (2006). PHEVs: The Cars that will Recharge America. New Society Publishers, Gabriola Island, Canada. ISBN 978-0-86571-571-4. ^ Cobb, Jeff (2014-12-10). "Retrospective: Four Years of Nissan Leaf and Chevy Volt". HybridCars.com. Retrieved 2016-10-01. ^ International Energy Agency, Clean Energy Ministerial, and Electric Vehicles Initiative (EVI) (March 2015). "Global EV Outlook 2015" (PDF). Clean Energy Ministerial. Archived from the original (PDF) on 2015-04-02. Retrieved 2015-03-14. CS1 maint: Multiple names: authors list (link) The EV Outlook 2015 figures include only passenger EVs and SUVs (excludes light-weight utility vehicles) and total sales/registrations figures correspond to the 16 EVI countries, which are estimated to represent 95% of the global PEV stock. As of December 2014[update], the Japanese stock of EVs totaled 108,241 units, and China had about 36,500 BEV buses. ^ Jeff Cobb (2015-09-16). "One Million Global Plug-In Sales Milestone Reached". HybridCars.com. Retrieved 2015-10-10. ^ a b Cobb, Jeff (2016-05-11). "China Reports 500,000th Plug-in Vehicle Sold". HybridCars.com. Retrieved 2016-05-12. As of March 2016[update], a total of 502,572 new energy vehicles have been sold in China since 2011, consisting of 366,219 BEV vehicles (72.9%) and 136,353 PHEVs (27.1%). Sales since 2011 includes heavy-duty commercial vehicles such buses and sanitation trucks, and only accounts for vehicles manufactured in the country. ^ Cobb, Jeff (2016-05-09). "Norway Is Fourth Country To Register 100,000 Plug-in Cars". HybridCars.com. Retrieved 2016-05-09. As of April 2016[update], the United States is the leading country market with a stock of about 450,000 highway legal light-duty plug-in vehicles delivered since 2008. China ranks second with around 300,000 units sold since 2011, followed by Japan with about 150,000 plug-in units sold since 2009, both through March 2016. European sales are led by Norway with over 100,000 units registered by the end of April 2016. ^ a b c Cobb, Jeff (2016-06-15). "Europe Buys Its 500,000th Plug-in Vehicle". HybridCars.com. Retrieved 2016-06-15. As of May 2016[update], cumulative sales by country are led by the United States with a stock of more than 460,000 highway legal light-duty plug-in vehicles delivered since 2008. China ranks second with almost 390,000 units sold since 2011. Europe is the largest regional market with more than 500,000 plug-in passenger cars and vans registered through May 2016. ^ a b Cobb, Jeff (2016-09-01). "Americans Buy Their Half-Millionth Plug-in Car". HybridCars.com. Retrieved 2016-09-02. See other figures in graphs. ^ Cobb, Jeff (2016-09-28). "China Buys Half-Millionth Passenger Plug-in Car; On Track To Surpass US". HybridCars.com. Retrieved 2016-09-28. Sales of new energy vehicles totaled 689,447 units between 2011 and August 2016. Cumulative sales of new energy passenger cars totaled 493,290 units between 2010 and August 2016. ^ Shahan, Zachary (2016-11-22). "1 Million Pure EVs Worldwide: EV Revolution Begins!". Clean Technica. Retrieved 2016-11-23. ^ a b c d e f Cobb, Jeff (2016-10-10). "France Becomes Fifth Nation To Buy 100,000 Plug-in Vehicles". HybridCars.com. Retrieved 2016-10-10. ^ a b Foucaud, Isabelle (2016-10-01). "Plus de 100.000 véhicules électriques circulent aujourd'hui en France" [More than 100,000 electric vehicles currently on the road in France]. Le Figaro (in French). Retrieved 2016-10-10. Environment Minister, Ségolène Royal, announced during the 2016 Paris Motor Show that there are more than 100,000 electric vehicles currently on French roads. ^ a b c Cobb, Jeff (2016-11-17). "The Netherlands Becomes Sixth Country To Buy 100,000 Plug-in Vehicles". HybridCars.com. Retrieved 2016-11-18. ^ Szczesny, Joseph (2018-12-11). "Sales of Electric Vehicles Growing Steadily in California". The Detroit Bureau. Retrieved 2018-12-13. ^ a b c d e f g h i j k l m International Energy Agency (IEA), Clean Energy Ministerial, and Electric Vehicles Initiative (EVI) (May 2018). "Global EV Outlook 2017: 3 million and counting" (PDF). IEA Publications. Retrieved 2019-01-21. CS1 maint: Multiple names: authors list (link) See pp. 9–10, 19–23, 29–28, and Statistical annex, pp. 107–113. ^ a b "China's new energy PV wholesale volume in 2018 shoots up 83% year on year". Gasgoo. 2019-01-11. Retrieved 2019-01-21. Sales of new energy passenger cars totaled 1,016,002 units in 2018.The BAIC EC series ranked as China's top selling plug-in car in 2018 with 90,637 units delivered. ^ a b c d e f g Automotive News China (2018-01-16). "Electrified vehicle sales surge 53% in 2017". Automotive News China. Retrieved 2018-01-19. Chinese sales of domestically-built new energy vehicles in 2017 totaled 777,000, consisting of 652,000 all-electric vehicles and 125,000 plug-in hybrid vehicles. Sales of domestically-produced new energy passenger vehicles totalled 579,000 units, consisting of 468,000 all-electric cars and 111,000 plug-in hybrids. Only domestically built all-electric vehicles, plug-in hybrids and fuel cell vehicles qualify for government subsidies in China. ^ a b c d e f g Kane, Mark (2019-01-24). "US Plug-In Electric Car Sales Charted: December 2018". InsideEVs.com. Retrieved 2019-01-24. See Graph: "Top 10 U.S. Plug-in cars (cumulative sales)" and "U.S. Plug-in Car Sales (cumulative)"
^ Cobb, Jeff (2017-01-11). "America's Plug-in Car Sales Were Their Best Ever in 2016". HybridCars.com and Baum & Associates. Retrieved 2017-01-12. Plug-in electric car sales in the U.S. totaled 157,181 units, up 37.6% from 2015 (114,248). The plug-in car segment achieved an all-time high market share of 0.90% of new car sales in 2016. As of December 2016[update], cumulative sales totaled 570,187 plug-in cars since 2008, with the Chevrolet Volt as the all-time best selling plug-in car with 113,489 units. ^ a b c Cobb, Jeff (2018-01-04). "December 2017 Dashboard". HybridCars.com and Baum & Associates. Retrieved 2018-01-21. Plug-in electric car sales in the U.S. totaled 194,479 units in 2017, consisting of 104,487 all-electric cars and 89,992 plug-in hybrids. The plug-in car segment achieved a market share of 1.13% of new car sales. ^ a b c d Opplysningsrådet for Veitrafikken AS (OFV). "Bilsalget i 2017" [Car sales in 2017] (in Norwegian). OFV. Retrieved 2018-01-11. A total of 71,737 plug-in electric vehicles were registered in Norway in 2017, consisting of: 33,025 new electric cars, 8,558 used imported all-electric cars, 29,236 new plug-in hybrid cars, 742 new all-electric vans, and 176 used imported all-electric vans. ^ Haugneland, Petter (2019-01-14). "Over 200.000 elbiler i Norge" [More than 200,000 electric cars in Norway] (in Norwegian). Norsk Elbilforening (Norwegian Electric Vehicle Association). Retrieved 2019-01-21. As of 31 December 2018[update], out of registered fleet of 2.72 million passenger cars, 7.17% are all-electric cars and 3.53% are plug-in hybrid cars (10.70% are plug-in electric cars). In addition, all-electric vans represent 1.1% of all registered vans in the country. ^ a b c Pontes, Jose (2019-01-29). "Japan December 2018". EVSales.com. Retrieved 2019-01-29. ^ a b c d Lane, Ben (January 2019). "Electric car market statistics". UK: Next Green Car. Retrieved 2019-01-17. As of 31 December 2018[update], the total UK light-duty electric fleet totals 212,000 plug-in electric vehicles, consisting of about 102,000 plug-in cars and 10,000 plug-in electric commercial vans. This figure includes a significant number of registered plug-in electric cars and vans which were not eligible for the grant schemes. ^ a b c d e f Society of Motor Manufacturers and Traders (SMMT) (2019-01-07). "December – EV registrations". SMMT. Retrieved 2019-01-17. Registrations in 2018 totaled 59,911 plug-in electric vehicles consisting of 15,474 all-electric cars and 44,437 plug-in hybrids. The all-electric market share was 0.7% in 2018 and for plug-in hybrids was 1.9%. ^ a b c d European Automobile Manufacturers Association (ACEA) (November 2018). "ACEA Report: Vehicles in use Europe 2018" (PDF). ACEA. Retrieved 2019-01-21. See table "VEHICLES IN USE BY FUEL TYPE - Passenger cars", pp. 12. ^ a b c d France Mobilité Électrique - AVERE France (2017-01-09). "Plus de 27 000 véhicules électriques immatriculés en 2016, après un mois de décembre record" [More than 27,000 electric vehicles registered in 2016, after a record month of December] (in French). AVERE. Retrieved 2017-01-09. A total of 33,774 light-duty plug-in vehicles were registered in France in 2016 consisting of 27,751 BEV cars, 5,556 electric utility vans and 6,467 PHEV cars. The EV segment achieved a market share of 1.40% of new car registrations in the country in 2016. ^ a b c d e f g France Mobilité Électrique - AVERE France (2018-01-09). "Près de 31 000 véhicules électriques immatriculés en France en 2017 !" [Nearly 31,000 electric vehicles registered in France in 2017!] (in French). AVERE. Retrieved 2018-01-17. A total of 41,724 light-duty plug-in electric vehicles were registered in France in 2017 consisting of 24,910 all-electric cars, 6,011 electric utility vans and 10,803 plug-in hybrid cars. The plug-in car segment achieved a market share of 1.98% of new car registrations in the country in 2017. ^ a b c d e f g h Kraftfahrt-Bundesamtes (KBA) (2018-01-12). "Neuzulassungsbarometer im Dezember 2017" [New Registrations Barometer December 2017] (in German). KBA. Retrieved 2018-01-12. A total of 29,436 plug-in hybrids and 25,056 all-electric cars were registered in Germany in 2017. ^ a b c d e f "Statistics Electric Vehicles in the Netherlands (up to and including January 2019)" (PDF). Rijksdienst voor Ondernemend Nederland (RVO) - Dutch National Office for Enterprising -. RVO. February 2019. Retrieved 2019-02-08. As of 31 December 2018[update], there were 145,882 highway legal light-duty plug-in electric vehicles registered in the Netherlands, consisting of 97,702 plug-in hybrids, 44,984 pure electric cars, and 3,196 all-electric light utility vans. With a total of 24,273 Mitsubishi Outlander P-HEVs registered by the end of December 2018, the plug-in hybrid is the all-time top selling plug-in electric vehicle in the Netherlands. The Tesla Model S is the best selling all-electric car with 12,990 units registered. ^ a b c d e Bil Sweden (2019-01-07). "Nyregistreringar december 2018 (def)" [Definitive new registrations December 2018 (final)] (in Swedish). Bil Sweden. Retrieved 2018-01-20. Download the pdf file "PressRel1812_DEF.pdf" See tables: "Nyregistrerade supermiljöbilar december 2018", "Nyregistrerade miljöbilar per typ december 2018" and "Nyregistrerade eldrivna lätta lastbilar (högst 3,5 ton) per modell" - A total of 29,909 light-duty plug-in vehicles were registered in 2018, consisting of 22,074 plug-in hybrids, 7,078 all-electric cars, and 757 all-electric vans. Passenger car registrations totaled 379,393 units in 2017, of which, the plug-in segment captured a market share of 8.2%. ^ a b c d European Automobile Manufacturers Association (ACEA) (2019-02-07). "New Passenger Car Registrations By Fuel Type In The European Union: Quarter 4 2018" (PDF). ACEA. Retrieved 2019-02-07. See tables: "Battery Electric Vehicles (BEV) - New Passenger Car Registrations By Market In The EU + EFTA" and "Plug-In Hybrid Electric Vehicles (PHEV) - New Passenger Car Registrations By Market In The EU + EFTA" A total of 201,284 BEVs were registered in EU + EFTA region in 2018, and 135,775 in 2017. A total of 182,768 PHEVs were registered in 2018, and 153,297 in 2017. Combines sales of BEVs and PHEVs totaled 384,052 passenger cars in 2018, and 289,072 in 2017. ^ a b c France Mobilité Électrique - AVERE France (2018-01-23). "En 2017, près de 150 000 véhicules électriques immatriculés à travers l'Europe" [Almost 150,000 electric vehicles registered across Europe in 2017] (in French). AVERE. Retrieved 2018-02-25. Registrations of new light-duty all-electric vehicles totaled 149,086 cars and vans in 2017 (excluding range-extender models), of which 132,687 units were passenger cars. ^ a b c Jose, Pontes (2019-01-28). "Europe December 2018". EVSales.com. Retrieved 2019-01-28. "European light commercial vehicles (vans) sales totaled about 22,000 units. The market share of the plug-in passenger car segment was 2.5%"
^ a b c d e California New Car Dealers Association (CNCDA) (February 2019). "New Vehicle Registrations Remained Above 2 million Units in 2018" (PDF). CNCDA. Retrieved 2019-02-21. See section: "Electric Vehicle Registrations Increased Sharply in 2018" - Figures for 2017 were revised. Shows registrations between 2014 and 2018. ^ a b China Association of Automobile Manufacturers (CAAM) (2015-01-14). "The sales and production of new energy vehicles boomed". CAAM. Retrieved 2015-01-14. ^ a b China Association of Automobile Manufacturers (2012-01-16). "5,579 electric cars sold in China in 2011". Wind Energy and Electric Vehicle Review. Retrieved 2014-01-12. ^ a b Cars21.com (2013-02-13). "EV sales increase 103.9% in China in 2012- Electric China Weekly No 17". Cars21.com. Retrieved 2014-01-12. ^ a b Jiang Xueqing (2014-01-11). "New-energy vehicles 'turning the corner'". China Daily. Retrieved 2014-01-12. ^ a b China Association of Automobile Manufacturers (CAAM) (2016-01-20). "New energy vehicles enjoyed a high-speed growth". CAAM. Retrieved 2016-02-08. ^ a b c d e f "中汽协：2018年新能源汽车产销均超125万辆，同比增长60%" [China Automobile Association: In 2018, the production and sales of new energy vehicles exceeded 1.25 million units, a year-on-year increase of 60%] (in Chinese). D1EV.com. 2019-01-14. Retrieved 2019-01-15. Chinese sales of new energy vehicles in 2018 totaled 1.256 million, consisting of 984,000 all-electric vehicles and 271,000 plug-in hybrid vehicles. ^ Jose, Pontes (2017-01-31). "Markets Roundup December 2016 (Special Edition)". EVSales.com. Retrieved 2017-02-08. For countries with top PEV market share in 2016 see "II. Engines of Growth: By EV share - Hong Kong ~5%, Iceland 4.6%, Switzerland 1.8%, Belgium 1.8, and 1.6% Austria. ^ Jose, Pontes (2016-02-03). "Markets Roundup December 2015 (Special Edition)". EVSales.com. Retrieved 2016-02-17. For countries with top PEV market share in 2015 see "Engines of Growth:" Hong Kong 4.84%, Denmark 2.29%, and Switzerland 1.98%. ^ a b c Jeff Cobb (2015-02-18). "Top 6 Plug-In Vehicle Adopting Countries – 2014". HybridCars.com. Retrieved 2015-02-18. ^ Zachary Shahan (2013-03-07). "Electric vehicle market share in 19 countries". ABB Conversations. Retrieved 2014-04-12. ^ a b c d e f European Alternative Fuels Observatory (eafo) (February 2018). "PEV (M1) market share in Europe". eafo. Retrieved 2018-02-26. The plug-in passenger car market share in Europe was 1.74%, corresponding to 0.93% for plug-in hybrids and 0.81% for all-electric cars. Put the mouse over the bar graph to see market share by year. ^ Jose, Pontes (2016-01-29). "Iceland December 2015". EVSales.com. Retrieved 2016-02-17. ^ Jose Pontes (2015-02-06). "Markets Roundup December 2014 (Special Edition)". EV Sales. Retrieved 2015-03-15. See section "Engines of Growth - by EV share" Estonia's market shared in 2014 climbed to 1.57% from 0.68% in 2013. Iceland's market share grew from 0.21% in 2012, to 0.94% in 2013, to 2.71% in 2014. ^ Jose, Pontes (2019-01-17). "Iceland December 2018". EVSales.com. Retrieved 2019-01-17. ^ a b c d e Bil Sweden (2015-01-02). "Nyregistreringar december 2014 (prel)" [New registrations in December 2014 (preliminar)] (in Swedish). Bil Sweden. Retrieved 2015-01-03. Download file "Nyregistreringar december 2014 (prel)" see tables: "Nyregistrerade supermiljöbilar december 2014" with summary of passenger EV registrations by model for 2013 (revised) and 2014; table "Nyregistrerade eldrivna lätta lastbilar (högst 3,5 ton) per modell:" for plug-in utility vans registrations for the same two years; and table "Nyregistrerade miljöbilar per typ jan-dec 2014" for the distribution of registrations by alternative fuels. A total of 303,866 new passenger vehicles were registered in 2014, and a total of 4,656 super clean cars, resulting in a PEV market share of 1.53% of new car sales. ^ a b c d e Bil Sweden (2018-01-08). "Definitiva nyregistreringar under 2017" [Definitive new registrations in 2017] (in Swedish). Bil Sweden. Retrieved 2018-01-31. Download the pdf file "PressRel1712_DEF.pdf" See tables: "Nyregistrerade supermiljöbilar december 2017", "Nyregistrerade miljöbilar per typ december 2017" and "Nyregistrerade eldrivna lätta lastbilar (högst 3,5 ton) per modell" - A total of 19,981 light-duty plug-in vehicles were registered in 2017, consisting of 15,447 plug-in hybrids, 4,217 all-electric cars, and 317 all-electric vans. Passenger car registrations totaled 379,393 units in 2017, of which, the plug-in segment captured a market share of 5.2%. Registrations of super green cars totaled 19,211 units, up from 12,995 in 2016. Table "Nyregistrerade miljöbilar per typ december 2017" reports 2017 figures that do not add up with detailed count in table "Nyregistrerade miljöpersonbilar december 2017" so, plug-in cars figures were taken from the latter. ^ a b c d e f "Statistics Electric Vehicles in the Netherlands" (PDF). Rijksdienst voor Ondernemend Nederland (RVO) - Dutch National Office for Enterprising -. RVO. January 2018. Archived from the original (PDF) on 2018-01-17. Retrieved 2018-01-16. With a total of 25,134 Mitsubishi Outlander P-HEVs registered by the end of December 2017, the plug-in hybrid is the all-time top selling plug-in electric vehicle in the Netherlands. The Tesla Model S is the best selling all-electric car with 8,028 units registered. ^ Jose, Pontes (2019-01-09). "Finland December 2018". EVSales.com. Retrieved 2019-01-17. ^ a b Jeff Cobb (2014-01-16). "Top 6 Plug-In Vehicle Adopting Countries". HybridCars.com. Retrieved 2014-01-18. Over 172,000 highway-capable passenger vehicles have been sold in the U.S. between 2008 and December 2013. ^ Jose, Pontes (2016-01-12). "China December 2015 (3rd Update)". EVSales.com. Retrieved 2016-02-08. ^ Jose, Pontes (2019-01-22). "China December 2018". EVSales.com. Retrieved 2019-01-22. ^ Pontes, Jose (2019-01-24). "Portugal December 2018". EVSales.com. Retrieved 2019-01-24. ^ Statistik Austria (2016-03-16). "Kraftfahrzeuge - Neuzulassungen: Neuzulassungen nach Jahren" [Motor vehicles - registrations: Registrations by year] (in German). Statistik Austria. Retrieved 2016-03-20. Download the file "Kfz-Neuzulassungen Jänner bis Dezember 2015." A total of 2,778 passenger plug-in cars were sold in Austria in 2015 out of 308,555 passenger cars, resulting in a market share of 0.90% (see pp. 78 PDF version). ^ Pontes, Jose (2019-01-24). "Austria December 2018". EVSales.com. Retrieved 2019-01-24. ^ Jose Pontes (2015-01-18). "Switzerland December 2014". EVSales.com. Retrieved 2015-03-15. Switzerland's PEV market shared in 2014 was 0.75% of total new car sales. ^ a b c Society of Motor Manufacturers and Traders(SMMT) (2015-01-07). "December 2014 – EV registrations". SMT. Retrieved 2015-01-08. A total of 14,518 plug-in cars were registered during 2014, consisting of 6,697 BEVs and 7,821 PHEVs, up from 3,586 plug-in cars were registered in 2013. A total of 2,476,435 new cars were registered in 2014. ^ a b c Society of Motor Manufacturers and Traders (SMMT) (2018-01-05). "December – EV registrations". SMMT. Retrieved 2018-01-11. Registrations in 2017 totaled 47,263 plug-in electric vehicles consisting of 13,597 all-electric cars and 33,6663 plug-in hybrids. Of these, a total of 45,187 cars were eligible for the Plug-in Car Grant. Since its launch in 2011, a total of 127,509 cars eligible for the PICG have been registered through December 2017. A total of 2,540,617 new cars were registered in 2017, resulting in a plug-in electric car market share of 1.86% of new car sales. ^ Jose, Pontes (2019-01-04). "Belgium December 2018". EVSales.com. Retrieved 2019-01-21. ^ a b Irle, Roland. "USA Plug-in Sales for 2018 Full Year". EV-volumes.com. Retrieved 20 January 2019. ^ a b Cobb, Jeff (2016-01-06). "December 2015 Dashboard". HybridCars.com and Baum & Associates. Retrieved 2016-03-14. ^ Jeff Cobb (2015-01-06). "December 2014 Dashboard". HybridCars.com and Baum & Associates. Retrieved 2015-01-06. ^ Jose Pontes (2015-01-10). "Denmark December 2014". EVSales.com. Retrieved 2015-03-15. Denmark's PEV market shared in 2014 was 0.88% of total new car sales. ^ Jose, Pontes (2019-01-16). "Denmark December 2018". EVSales.com. Retrieved 2019-01-21. ^ a b c Kraftfahrt-Bundesamtes (KBA) (January 2016). "Neuzulassungsbarometer im Dezember 2015" [New Registrations Barometer December 2015] (in German). KBA. Retrieved 2015-01-21. A total of 23,464 plug-in cars registered in Germany during 2015, consisting of 12,363 BEV cars and 11,101 PHEVs. ^ a b Hall, Larry E. (2016-10-07). "German Plug-in Car Sales Surge Past 1 Percent For First Time in September". HybridCars.com. Retrieved 2016-10-07. ^ a b Jose Pontes (2018-02-02). "Japan December 2017". EV Sales. Retrieved 2018-02-17. About 56,000 plug-in electric cars were sold in Japan in 2017. ^ California New Car Dealers Association (CNCDA) (February 2016). "California New Vehicle Registrations Expected to Remain Above 2 Million Units in 2016" (PDF). CNCDA. Archived from the original (PDF) on 2016-02-17. Retrieved 2016-02-17. Registrations through December 2015 since 2011. Revised figures for 2014. ^ LeSage, Jon (2016-02-06). "Renault Zoe Ekes By Mitsubishi Outlander in 2016 European Plug-in Sales". HybridCars.com. Retrieved 2017-02-06. ^ Automotive Industry Data (AID) (2016-02-15). "PHEVs - Take off or transitory blip?". AID Newsletter. Retrieved 2016-02-19. Market share only includes Western European countries. A total of 95,140 PHEV cars were sold in Europe in 2015. ^ Staff (February 2016). "Europe Plug-in Sales Q4 and Full Year 2015". EVvolumes.com. Retrieved 2016-02-19. ^ International Council on Clean Transportation (ICCT) (2014). "European Vehicle Market Statistics Pocketbook" (PDF). ICCT. Retrieved 2016-02-21. See page 88: EU-28 market share in 2013 was 0.42% (includes BEV cars and PHEVs). Adjusted to consider sales/registrations in Norway (5.79%) and Switzerland (0.57%) the market share rises to 0.49%. ^ a b "EV Sales". ^ Philippe Schwoerer (2015-01-09). "Quel marché espérer en 2015 pour le véhicule électrique ?" [What the market expects in 2015 for the electric vehicle] (in French). Association pour l'Avenir du Véhicule Electrique Méditerranéen (AVEM). Retrieved 2015-02-01. The BMW i3 with range extender is often excluded of the count of BEV cars because in France it is classified and accounted together with conventional hybrids. ^ "The Most Environmentally Friendly Country for Electric Cars May Surprise You". Inverse. Retrieved 2018-05-18. ^ Coren, Michael J. "The best and worst countries for emissions from electric cars". Quartz. Retrieved 2018-05-18. ^ a b "Albanian Police equipped with Electric Cars - DigitalSpoiler". digitalspoiler.com. Retrieved 2018-05-18. ^ "Switching the Fleet to Electric Vehicles - Saytaxi Albania Success Story - White label apps for your taxi or limo company". White label apps for your taxi or limo company. 2017-04-26. Retrieved 2018-05-18. ^ a b Times, Tirana (2017-10-31). "Tirana conducts tests to launch public transport electric buses". Tirana Times. Retrieved 2018-06-12. ^ Jose Pontes (2014-01-18). "Australia December 2013". EVSales.com. Retrieved 2014-01-19. ^ Mat Gasnier (2014-01-16). "Australia Q4 2013: Jeep Grand Cherokee shines". Best Selling Cars Blog. Retrieved 2014-01-19. ^ Pontes, Jose (2015-01-15). "Australia Full Year 2014 (Updated)". EV Sales. Retrieved 2015-01-15. Tesla Model S sales estimate is too low, see next source. ^ "Global Mitsubishi Outlander PHEV Sales Pass the 100,000 Mark" (Press release). UK: Mitsubishi Motors UK. 2016-05-19. Retrieved 2016-05-22. As of March 2016[update], a total of 65,529 units have been sold in Europe (21,052 in the UK and 44,477 in the rest of Europe), 33,730 in Japan, 2,015 in Australia and 259 in the rest of the world, for a total of 101,533 units sold worldwide. ^ David McCowen (2015-05-26). "Why the Tesla is Australia's best-selling electric car". Drive. Retrieved 2015-07-13. ^ Hallenbeck, Todd (2017-01-06). "Nissan grows a better LEAF". Motoring. Retrieved 2017-01-07. ^ "Electric vehicle charging network by ChargePoint". Chargepoint Australia. Retrieved 2015-01-06. ^ "Voiture électrique : cri d'alarme..." 14 May 2013. ^ Carine Mathieu (2012-10-12). "La voiture électrique ne s'impose toujours pas" [The electric car still is not essential]. L'Echo (in French). Retrieved 2012-11-17. ^ a b "Conseil des Ministres : nouvelles mesures éco-fiscales, Press Release" (PDF) (in French). Ministre des Finances. 2009-11-20. Archived from the original (PDF) on 2011-07-06. Retrieved 2010-05-24. ^ "Incitants à l'achat de véhicules électriques en Belgique, Press Release". Going Electric. 2010-02-04. Archived from the original on 2011-10-05. Retrieved 2011-06-11. ^ a b c "Overview of Tax Incentives for Electric Vehicles in the EU" (PDF). European Automobile Manufacturers Association. 2010-04-20. Archived from the original (PDF) on 2011-06-11. Retrieved 2010-05-18. ^ a b "Isenção de rodízio vai beneficiar 387 carros elétricos e híbridos em SP" [Driving restriction exemption will benefit 387 electric and hybrid cars]. Estadão de São Paulo (in Portuguese). Universo Online (UOL). 2015-09-14. Retrieved 2015-12-31. ^ Philippe Crowe (2013-03-06). "15 Nissan Leaf For Rio de Janeiro Taxi Duty". HybridCars.com. Retrieved 2013-03-09. ^ Miotto, Rafael (2016-06-17). "Agora o mais econômico do Brasil, Prius confirma vocação para cidade" [Now Brazil's top fuel economy car, the Prius confirms its city vocation]. Globo G1 (in Portuguese). Retrieved 2016-06-21. ^ André Trigueiro; Roberto Kovalick (2013-02-08). "Utilização de carros elétricos cresce lentamente no Brasil" [Electric car use in Brazil is growing slowly]. Jornal da Globo (in Portuguese). Retrieved 2013-02-20. ^ André Trigueiro (2013-02-08). "Falta de incentivo e carga tributária inviabilizam carro elétrico no Brasil" [Lack of incentives and tax burden make unfeasible the electric car in Brazil]. Jornal da Globo (in Portuguese). Retrieved 2013-02-20. ^ Cleide Silva (2014-03-21). "Pacote do governo prevê redução de impostos para carros elétricos" [Government package provides tax breaks for electric cars]. O Estado de S. Paulo (in Portuguese). Retrieved 2014-08-22. ^ Leonardo Felix (2014-09-10). "Elétrico, BMW i3 chega com preço de 9 populares e isenção do rodízio em SP" [BMW i3 electric arrives with price of nine popular cars and exempted from São Paulo's driving restriction]. Universo Online (UOL) (in Portuguese). Retrieved 2014-09-20. ^ a b Schmidt, Eric (2018-02-18). "Electric Vehicle Sales In Canada, 2017". FleetCarma News. Retrieved 2018-02-17. ^ Eric Loveday (2011-04-11). "Quebec to offer plug-in vehicle rebates of up to C$8,000". AutoblogGreen. Retrieved 2011-06-08. ^ "Running on Green Power! Electric Vehicles: 2011-2020 Québec Action Plan" (PDF). Gouvernement du Québec. 2011. Retrieved 2011-06-08. See Table Box 7 for the rebate details and how it changes by year. ^ Klippenstein, Matthew (2013-11-07). "Will Quebec Join California, Oregon As Electric-Car Pioneers?". Green Car Reports. Retrieved 2016-10-28. ^ "The Clean Energy Vehicle (CEV) Program". LiveSmart BC. 2011-11-05. Archived from the original on 2011-11-14. Retrieved 2011-11-13. ^ "Table 1 –Examples of Clean Energy Vehicles and Incentive Levels" (PDF). LiveSmart BC. Archived from the original (PDF) on 2012-04-03. Retrieved 2011-11-13. ^ a b Liu Wanxiang (2017-01-12). "中汽协：2016年新能源汽车产销量均超50万辆,同比增速约50%" [China Auto Association: 2016 new energy vehicle production and sales were over 500,000, an increase of about 50%] (in Chinese). D1EV.com. Retrieved 2017-01-12. Chinese sales of new energy vehicles in 2016 totaled 507,000, consisting of 409,000 BEV vehicles and 98,000 PHEVs. ^ a b Cobb, Jeff (2016-12-27). "China Takes Lead As Number One In Plug-in Vehicle Sales". HybridCars.com. Retrieved 2017-01-06. As of November 2016[update], cumulative sales of plug-in vehicles in China totaled 846,447 units, including passenger and commercial vehicles, making it the world's leader in overall plug-in vehicle sales. With cumulative sales of about 600,000 passenger plug-ins through November 2016, China is also the global leader in the passenger plug-in car segment, ahead of Europe and the U.S.
^ Liu Wanxiang (2016-12-09). "乘联会：11月新能源乘用车销售4.2万辆 众泰、比亚迪、吉利表现强劲" [By the Automobile Association: November new energy passenger car sales totaled 42,000 units] (in Chinese). D1EV.com. Retrieved 2016-12-17. Sales of new energy passenger cars in China totaled 41,795 units in November 2016, consisting of 26,811 BEV cars and 4,178 PHEVs. Sales of new energy passenger car totaled 282,292 units between January and November 2016, consisting of 208,839 BEV cars and 73,453 PHEVs. ^ Liu Wanxiang (2017-01-11). "乘联会：新能源乘用车2016年销量32万辆 比亚迪\吉利\北汽稳居前三" [By the Federation: new energy passenger car sales in 2016 totaled 320,000 units] (in Chinese). D1EV.com. Retrieved 2017-01-12. Sales of new energy vehicles in China totaled 320,081 units, consisting of 239,830 BEV cars and 80,251 PHEVss. ^ King, Danny (2016-12-29). "China far ahead of US, Europe in total electric vehicle sales". Autoblog.com. Retrieved 2017-01-09. Last year, China overtook both the US and Europe in annual sales of electric vehicles and PHEVs. This year, it will move ahead of both the US and Europe in cumulative plug-in vehicle sales. ^ Dune, Michael J. (2016-12-14). "China's Automotive 2030 Blueprint: No. 1 Globally In EVs, Autonomous Cars". Forbes. Retrieved 2016-12-14. ^ Liu Wanxiang (2016-10-12). "中汽协：同比增速放缓 9月新能源汽车销量攀升至4.4万辆" [Automobile Association: slowdown ends, new energy vehicle sales in September rose to 44 000] (in Chinese). D1EV.com. Retrieved 2016-10-12. Sales of new energy vehicles totaled 289,000 units between January and September 2016, consisting of 216,000 BEV vehicles and 73,000 PHEVs. In September, sales totaled 44,000 units, consisting of 35,000 BEV vehicles and 9,000 PHEVs. Total car sales during the first nine months of 2016 totaled 19,360,000 units. ^ Staff (2016-05-11). "中汽协：4月新能源汽车产销同步破3万辆 同比增长近2倍" [Automobile Association: April sales of new energy vehicles sync break 30,000, an increase of nearly 2-fold] (in Chinese). D1EV.com. Retrieved 2016-07-31. Sales of new energy vehicles totaled 31,772 units in April 2016, consisting of 23,908 BEV vehicles and 7,864 PHEVs. ^ China Association of Automobile Manufacturers (CAAM) (2016-06-29). "New energy vehicles kept a high-speed growth". CAAM. Retrieved 2016-07-31. Sales of new energy vehicles totaled 35,000 units in May 2016, consisting of 26,000 BEV vehicles and 9,000 PHEVs. ^ China Association of Automobile Manufacturers (CAAM) (2016-07-22). "New energy vehicles kept a high-speed growth". CAAM. Retrieved 2016-07-31. Sales of new energy vehicles totaled 44,000 units in June 2016, consisting of 34,000 BEV vehicles and 10,000 PHEVs. Cumulative sales of new energy vehicles in China during the first half of 2016 totaled 170,000 units, consisting of 126,000 BEV vehicles and 44,000 PHEVs. ^ China Association of Automobile Manufacturers (CAAM) (2016-08-15). "New energy vehicles kept a high-speed growth". CAAM. Retrieved 2016-10-12. Sales of new energy vehicles totaled 36,000 units in July 2016, consisting of 26,000 BEV vehicles and 10,000 PHEVs. ^ Liu Wanxiang (2016-09-09). "中汽协：8月新能源汽车产量回升至4.2万辆 同比增幅达82%" [August new energy vehicle production rose to 42,000 an increase of 82%] (in Chinese). D1EV.com. Retrieved 2016-10-12. Sales of new energy vehicles totaled 38,000 units in August 2016, consisting of 28,000 BEV vehicles and 10,000 PHEVs. ^ Majeed, Abdul (2016-09-29). "China faces acid test in vehicle emissions". Business Line. Retrieved 2016-09-29. ^ Henry Lee; Sabrina Howell; Adam Heal (June 2014). "Leapfrogging or Stalling Out? Electric Vehicles in China". Belfer Center, Harvard Kennedy School. Retrieved 2015-01-18. Download EVS in China (full report). See Table 2: Chinas's EV Sales by Brand, 2011-2013, pp.19. ^ Reuters (2014-03-03). "Chinese cities open up green car markets as government battles pollution". Global Post. Retrieved 2014-03-21. ^ Mike Millikin (2012-07-09). "China publishes plan to boost fuel-efficient and new energy vehicles and domestic auto industry; targeting 500K PHEVs and EVs in 2015, rising to 2M by 2020". Green Car Congress. Retrieved 2014-03-22. ^ Xinhua (2014-02-15). "New energy vehicle sales set at 160,000 for 2014 in China". Want China Times. Archived from the original on 2014-03-22. Retrieved 2014-03-21. ^ Gu Liping (2014-09-07). "China's Jan.-Aug. NEV production up 328 percent". Xinhua. ECNS. Retrieved 2014-09-07. ^ Wang, Shanyong; Li, Jun; Zhao, Dingtao (November 2017). "The impact of policy measures on consumer intention to adopt electric vehicles: Evidence from China". Transportation Research Part A: Policy and Practice. 105: 14–26. doi:10.1016/j.tra.2017.08.013. ^ "China Announces Plan to Subsidize EVs and PHEVs in Five Major Cities". Edmunds.com. 2010-06-01. Archived from the original on 2010-06-05. Retrieved 2010-06-14. ^ Motavalli, Jim (2010-06-02). "China to Start Pilot Program, Providing Subsidies for Electric Cars and Hybrids". New York Times. Retrieved 2010-06-02. ^ "China announces new electric car subsidy program". China Economic Review. 2013-09-18. Archived from the original on 2013-12-17. Retrieved 2013-09-18. ^ "New license plates to differentiate new energy vehicles". Xinhua. 2016-04-18. Retrieved 2016-04-19. ^ Alejandro Marimán Ibarra (2011-05-04). "Mitsubishi i-MIEV: Lanzado oficialmente en Chile" (in Spanish). Yahoo Chile. Archived from the original on 2011-10-21. Retrieved 2011-07-21. ^ "Bogotá Launches BEV Taxi Fleet Using Long-Range BYD e6 Cross-over Sedan". YAHOO FINANCE. 2012-12-11. Retrieved 2013-04-22. ^ "Bogota Taxi Fleet to Get 46 BYD E6 EVs in 2013". autoevolution. Retrieved 2013-04-22. ^ Claudia Cristina Garcés (2015-06-07). "Twizy, el carro eléctrico de Renault" [Twizy, Renault's electric car] (in Spanish). Portafolio.co. Retrieved 2015-12-04. ^ a b c Daniel Otero Bravo (2015-06-19). "Carros Eléctricos en Colombia: En Carga Lenta" [Electric Cars in Colombia: in Slow Charging]. El Tiempo (in Spanish). Retrieved 2015-12-02. ^ a b Jose, Pontes (2017-01-27). "Costa Rica December 2016". EVSales.com. Retrieved 2017-02-13. ^ Camila Salazar (2013-07-06). "Carros híbridos y eléctricos se abren paso en Costa Rica" [Hybrid and electric cars make their way in Costa Rica]. La Nación (San José) (in Spanish). Retrieved 2013-07-06. ^ Daniela Garcia (2013-01-21). "MINAE anuncia convenio para insertar taxis "verdes" en el país" [Ministry of Environment and Energy announces agreement to introduce green taxis] (in Spanish). Costa Rica Hoy. Retrieved 2013-05-01. ^ Alejandro Arley Vargas (2009-04-27). "En mes y medio venden 10 carros eléctricos" [Ten electric cars sold in month and a half]. Al Día (in Spanish). Archived from the original on 2010-05-02. Retrieved 2012-10-26. ^ "Carro 100% eléctrico i-miev ya recorre las calles del país" [i-MiEV 100% electric car is already on the country roads]. La Nación (San José) (in Spanish). Rebeca Madrigal. 2011-02-26. Retrieved 2011-02-26. ^ "Mitsubishi lanza auto eléctrico en Costa Rica" [Mitsubishi launches electric car in Costa Rica]. La Nación (San José) (in Spanish). ACAN-EFE. 2010-12-14. Retrieved 2011-01-12. ^ a b c d "Ponovo kreću subvencije za kupnju električnih vozila". Poslovni dnevnik (in Croatian). 13 September 2017. Retrieved 2017-09-13. ^ "Registered road vehicles and road traffic accidents, 2016" (Press release). Croatian Bureau of Statistics. 21 April 2017. Retrieved 2017-09-13. ^ "Večernjakova analiza: Isplati li se kupiti električni automobil?". Večernji list (in Croatian). 2 April 2015. Retrieved 2016-03-21. ^ "VELIKA USPOREDNA ANALIZA JUTARNJEG Što se više isplati: klasični ili auto na struju?". Jutarnji list (in Croatian). 1 July 2016. Retrieved 2017-04-04. ^ "Dansk Elbil Alliance - Bestand af elbiler i Danmark". danskelbilalliance.dk. Archived from the original on 2015-10-06. ^ a b Fergusson, Malcolm (October 2016). "Electric Vehicles in Europe - 2016: Approaching adolescence" (PDF). Transport & Environment. Retrieved 2016-10-13. See pp. 15-16. ^ De Danske Bilimportører (2018-01-08). "ÅRETS BILSALG 2017" [Car sales 2017] (in Danish). Bilimp. Retrieved 2018-02-13. See sections "Et stort dyk i salg af elbiler" and "Miljøbiler er ikke kun elbiler – hvordan ser fremtiden ud for andre miljøvenlige alternativer?" ^ "European Alternative Fuels Observatory". Retrieved 2017-09-13. ^ Fred Lambert (19 April 2017). "Denmark to relaunch its electric vehicle market with incentives after a year with almost no sales". Electritec. ^ Laurent J. Masson (2013-02-22). "Estonia Vies for EV Leadership in Europe". PluginCars.com. Retrieved 2013-02-24. ^ Justin Gerdes (2013-02-26). "Estonia Launches Nationwide Electric Vehicle Fast-Charging Network". Forbes. Retrieved 2016-10-31. ^ Tammik, Ott (2011-03-03). "State Buys 507 Electric Cars, Builds Charging Network". ERR. ^ "Estonia will promote the use of electric cars under a Green Investment Scheme". Government of Estonia. 2011-03-03. ^ "Mitsubishi begins delivery of the largest order of i-MiEVs to date; 50 of 507 to Estonian government". Green Car Congress. 2011-10-24. Retrieved 2011-10-26. ^ Ingrid Teesalu (2011-10-14). "One in Four Electric Cars Still Unclaimed". ERR News. Retrieved 2011-10-27. ^ Ingrid Teesalu (2011-08-16). "Municipalities Skeptical About Acquiring Electric Cars". ERR News. Retrieved 2011-10-27. ^ Ingrid Teesalu (2011-09-05). "Municipalities Show Lukewarm Interest in Electric Cars". ERR News. Estonia: ERR. Retrieved 2011-10-27. ^ Tubalkain, Marge (2016-04-01). "Eestis müüdi mullu 34 elektriautot" [34 electric cars were sold in Estonia last year]. Majandus24 (in Estonian). Postimees. Retrieved 2016-04-01. ^ a b c d Yle (2016-11-20). "Finnish government to kickstart electric car market". Yle. Retrieved 2016-11-26. ^ European Automobile Manufacturers Association (ACEA) (2016-10-28). "New Passenger Car Registrations by Alternative Fuel Type in the European Union – Quarter 3 2016" (PDF). ACEA. Retrieved 2016-11-02. A total of 143,315 new passenger plug-in vehicles were registered in the European Union and two EFTA countries during the first nine months of 2016, consisting of 65,270 BEV cars and 76,037 PHEVs (See tables pp. 2 and 3). Light-duty utility vans are not included. ^ "Valmet Automotive to start production of Think electric car". Metso. 2009-08-27. Archived from the original on 2009-08-30. Retrieved 2009-09-14. ^ "Koiviston Auto". Koiviston Auto. ^ "home - Electric Raceabout". raceabout.fi. Archived from the original on 2010-04-08. ^ "Electric Cars - Now!". Sähköautot - Nyt!. Retrieved 2009-08-20. ^ a b c Automobile Propre (October 2016). "Chiffres de vente & immatriculations de voitures électriques en France" [Sales figures & electric car registrations in France] (in French). Automobile Propre. Retrieved 2016-10-09. See "Ventes de voitures électriques en 2016, 2015, 2014, 2013, 2012, 2011 and 2010" It shows all electric car registrations between 2010 and 2016. ^ Justin Aschard (2012-11-07). "Novembre 2012 - Ventes de véhicules électriques (CCFA)" [November 2012 - Sales of electric vehicles (CCFA)] (in French). France Mobilité Électrique. Archived from the original on October 14, 2013. Retrieved 2013-02-16. See table Bilan annuel des ventes de véhicules électriques (Annual sales of electric vehicles) for detailed sales by category during 2010 and 2011: a total of 184 electric cars and 796 electric utility vans were registered in 2010, and 2,630 electric cars and 1,682 BEV utility vehicles were registered in 2011. ^ France Mobilité Électrique - AVERE France (2013-01-07). "Bilan des Immatriculations pour l'Année 2012" [Record Registrations for 2012] (in French). AVERE. Archived from the original on October 20, 2013. Retrieved 2013-02-16. A total of 5,663 electric cars and 3,651 electric vans were registered in France in 2012. ^ AVERE-France (2015-01-05). "Le marché du véhicule électrique maintient sa progression en 2014" [The electric vehicle market continues to grow in 2014] (in French). AVERE France. Retrieved 2015-02-02. A total of 10,560 electric cars were registered in 2014, up from 8,779 in 2013. A total of 4,485 BEV utility vehicles were registered in 2014, down from 5,175 in 2013. ^ Michaël Torregrossa (2013-01-15). "Voitures hybrides – Le bilan des immatriculations 2012 en France" [Hybrid Cars - The balance of 2012 registrations in France] (in French). Association pour l'Avenir du Véhicule Electrique Méditerranéen (AVEM). Retrieved 2013-01-15. ^ Michaël Torregrossa (2014-01-19). "Hybride rechargeable – Le marché français stagne en 2013" [Rechargeable hybrids - The French market stagnated in 2013] (in French). Association pour l'Avenir du Véhicule Electrique Méditerranéen (AVEM). Retrieved 2014-01-19. ^ France Mobilité Électrique - AVERE France (2016-01-07). "Immatriculations des voitures électriques : + 62,1% en 2015" [BEV car registrations: + 62.1% in 2015] (in French). AVERE. Retrieved 2016-05-14. A total of 17,779 BEV cars were registered in France in 2015. This figure accounts of 822 BMW i3s, including the model with a range extender. ^ France Mobilité Électrique - AVERE France (2016-01-08). "Immatriculations des hybrides rechargeables : La barre des 5.000 est franchie !" [PHEV registrations: The 5,000 barrier is achieved!] (in French). AVERE. Retrieved 2016-07-03. A total of 5,006 PHEVs were registered in France in 2015, up from 1,527 in 2014. ^ France Mobilité Électrique - AVERE France (2016-01-12). "Immatriculations des utilitaires électriques : + 9,6% en 2015" [BEV utility vehicle registrations: + 9.6% in 2015] (in French). AVERE. Retrieved 2016-05-14. A total of 4,916 BEV utility vans were registered in France in 2015. ^ Institute for European Environmental Policy (IEEP) (2014-05-30). "Environmental Tax Reform in Europe: Opportunities for the Future" (PDF). IEEP. Archived from the original (PDF) on 2016-10-09. Retrieved 2016-10-08. See Chapter 3 - Car Registration Tax (‘Bonus-Malus’ system) in France pp. 15-21. ^ Schwoerer, Philippe (2016-10-06). "Les aides pour les 2, 3 et 4 roues électriques en 2017 annoncées par Ségolène Royal" [Subsidy for the two-, three- and four-wheeled electric motorcycles by 2017 announced by Ségolène Royal] (in French). Association pour l'Avenir du Véhicule Electrique Méditerranéen (AVEM). Retrieved 2016-10-08. ^ a b Kraftfahrt-Bundesamtes (KBA) (January 2015). "Neuzulassungsbarometer im Dezember 2014" [New Registrations Barometer December 2014] (in German). KBA. Retrieved 2015-01-27. A total of 13,049 plug-in cars registered in Germany during 2014, consisting of 8,522 BEV cars and 4,527 PHEVs. ^ Kraftfahrt-Bundesamtes (KBA). "Monatliche Neuzulassungen - Neuzulassungsbarometer im Dezember 2013" [Monthly registrations - New registrations Barometer in December 2013] (in German). KBA. Retrieved 2014-09-06. A total of 1,385 PHEVs and 6,051 BEV cars were registered during 2013. ^ Autobild (2012-01-12). "2011 Full Year Best-Selling Electric Cars in Germany in 2011". BestSellingCars.com. Retrieved 2012-10-31. Cumulative number of registered electric cars was 4,541 as of January 1, 2012. BEV car and van registrations in 2010 totaled 541 units and 2,154 in 2011..
^ Kraftfahrt-Bundesamtes (KBA) (2013-01-31). "Neuzulassungen E-Mobilität 2012-Kaum Zuwachs wegen Twizy" [Registrations E-mobility - Low growth due to Twizy]. Auto Bild (in German). Retrieved 2013-02-14. A total of 2,956 BEV cars were registered in Germany during 2012. ^ Kraftfahrt-Bundesamtes (KBA) (January 2017). "Neuzulassungsbarometer im Dezember 2016" [New Registrations Barometer December 2015] (in German). KBA. Retrieved 2017-01-11. A total of 25,154 plug-in cars were registered in Germany in 2016, consisting of 11,410 BEV cars and 13,744 PHEVs. ^ Kraftfahrt-Bundesamtes (KBA). "Monatliche Neuzulassungen - Neuzulassungsbarometer im Juni 2014" [Monthly registrations - New registrations Barometer in June 2014] (in German). KBA. Retrieved 2014-09-06. A total of 1,575 PHEVs and 4,188 electric cars were registered during the first six months of 2014. ^ Brian Parkin; Dorothee Tschampa (2014-12-02). "Merkel Backs Incentives in Push for a Million Electric Cars". Bloomberg Businessweek. Archived from the original on 2014-12-07. Retrieved 2014-12-07. ^ Kraftfahrt-Bundesamt (KBA) (January 2018). "Neuzulassungen von Personenkraftwagen nach Marken und Modellreihen im Dezember 2017 (FZ 10) (XLS, 153 KB, Datei ist nicht barrierefrei)" [New registrations of passenger cars by segments and models in December 2016] (in German). KBA. Retrieved 2018-01-13. Click on the link Neuzulassungen von Personenkraftwagen nach Marken und Modellreihen im Dezember 2017 (FZ 10) (XLS, 153 KB, Datei ist nicht barrierefrei) to download the file with registrations figures. ^ Henk Bekker (2014-03-29). "2014 Germany: Total Number of Electric Cars". BestSellingCars.com. Retrieved 2014-08-23. Cumulative number of registered electric cars was 12,156 as of January 1, 2014. ^ a b John Blau (2010-05-03). "Berlin plugs in electric mobility strategy". Deutsche Welle. Retrieved 2014-08-24. ^ Barbara Praetorius (2011). "E-Mobility in Germany: A research agenda for studying the diffusion of innovative mobility concepts" (PDF). ECEEE. Archived from the original (PDF) on 2014-08-26. Retrieved 2014-08-24. ^ Staff (2014-08-04). "Förderung von Elektroautos kommt ins Rollen" [Promotion of electric cars gets rolling]. KFZ-betrieb (in German). Archived from the original on 2014-08-26. Retrieved 2014-08-24. ^ Faye Sunderland (2014-08-15). "Germany plans new EV incentives to spur uptake". The Green Car Website UK. Retrieved 2014-08-24. ^ Staff (2015-03-06). "Elektromobilitätsgesetz:Bundestag beschließt Vorfahrt für E-Autos" [Electric Mobility Act: Bundestag passes priority for electric cars]. Spiegel Online (in German). Retrieved 2015-03-14. ^ Staff (2015-03-05). "Bundestag will Vorfahrt für E-Autos" [Bundestag wants Priority for electric cars]. KFZ-betrieb (in German). Archived from the original on 2015-03-15. Retrieved 2015-03-14. ^ Kraftfahrt-Bundesamtes (KBA) (October 2016). "Neuzulassungsbarometer im September 2016" [New Registrations Barometer September 2016] (in German). KBA. Retrieved 2016-10-07. A total of 17,074 plug-in cars were registered in Germany between January and September 2016, consisting of 7,678 BEV cars and 9,396 PHEVs. ^ Cremer, Andreas (2016-04-27). "Germany to launch 1 billion-euro discount scheme for electric car buyers". Reuters. Retrieved 2016-05-14. ^ Agence France-Presse (2016-04-28). "Germany to give €1bn subsidy to boost electric car sales". The Guardian. Retrieved 2016-05-14. ^ Staff (2016-04-27). "Bis zu 4.000 Euro Förderung für Elektroautos" [Up to 4,000 euros in funding for electric cars]. KFZ-betrieb (in German). Archived from the original on 2016-06-16. Retrieved 2016-04-14. ^ "Prämie für E-Autos beschlossenWie komme ich jetzt an den Bonus?" [Premium For Electric Cars Decided, how do I get to the bonus?]. Bild (in German). 2016-05-18. Retrieved 2016-09-25. ^ Bundesamt für Wirtschaft und Ausfuhrkontrolle (BAFA) (2016-09-30). "Elektromobilität (Umweltbonus) Zwischenbilanz zum Antragstand vom 30. September 2016" [Electromobility (Environmental bonus) Interim balance of application as of 30 September 2016] (PDF) (in German). BAFA. Retrieved 2016-10-06. ^ Staff (2016-07-04). "Bislang 175 Anträge für Elektroauto-Prämie" [175 applications for electric car-premium up today]. KFZ-betrieb (in German). Archived from the original on 2016-09-27. Retrieved 2016-09-25. ^ Kutt, Gerhard (Dec 2017). "HK Transport Department Dec 2017: Registration and Licensing of Vehicles by Fuel Type" (PDF). ^ a b c d e Seah, Lionel; Tan, Christopher (2016-12-03). "Early adopters of electric cars unfazed by obstacles". The Straits Times. Retrieved 2016-12-03. According to Land Transport Authority figures, there are just 129 EVs and PHEVs here (as of end October), with BMW accounting for most of these cars. The 129 units translate to a mere 0.02 per cent of Singapore's car population of 601,948. ^ a b c d Environmental Protection Department (EPD) (October 2015). "Promotion of Electric Vehicles in Hong Kong". EPD. Retrieved 2015-11-28. ^ a b Josh Horwitz (2015-11-26). "In Hong Kong's luxury car market, a Tesla is cheap". Quartz (publication). Retrieved 2015-11-28. About 70% of the electric cars in Hong Kong roads by the end of Sept 2016 are Tesla Model S cars (~1,720 units). ^ Eric Loveday (2014-07-30). "Tesla Celebrates First Model S Deliveries In Hong Kong – Video". InsideEVs.com. Retrieved 2014-07-30. ^ Zen Soo (2015-07-02). "Hong Kong now has highest density of Tesla superchargers in the world". South China Morning Post. Retrieved 2015-11-28. ^ "Share of new electric and hybrid cars in Iceland second highest in Europe". Iceland Magazine. Retrieved 2017-09-13. ^ a b Jose, Pontes (2018-01-23). "Iceland December 2017". EVSales.com. Retrieved 2018-02-18. ^ Kjartan Kjartansson (2017-09-12). "Kolefnisgjald tvöfaldað til að draga úr losun" (in Icelandic). Vísir. ^ "Tesla Supercharger Map". Tesla Inc. Retrieved 2017-09-24. ^ Michael Sheils McNamee (2015-01-12). "Sales of electric cars in Ireland were up 400% last year*". The Journal. Retrieved 2016-01-23. ^ Ryan, Susan (2012-06-04). "How well is Ireland set up for electric cars?". The Journal. Retrieved 2016-01-23. ^ Cleary, Colin (2014-09-14). "Electric Cars In Ireland: How To Get To The Tipping Point?". Green Car Reports. Retrieved 2016-01-23. ^ "Dati vendite auto elettriche e ibride in Italia 2015". Retrieved 2016-02-27. ^ "Enel: raddoppiano auto elettriche nel 2018. Starace: Italia ce la fa". Fortune Italia (in Italian). 8 April 2019. Retrieved 12 April 2019. ^ "Ricarica privata domestica - e-Station". e-Station (in Italian). Retrieved 2017-03-02. ^ "Ricaricare l'auto elettrica in casa - Idee Green". www.ideegreen.it (in Italian). Retrieved 2017-03-02. ^ "Ricarica EV in casa, colonnina o presa domestica? - Idee Green". www.ideegreen.it (in Italian). Retrieved 2017-03-02. ^ a b c Kane, Mark (2017-01-25). "Nissan LEAF Sets Sales Record In Japan For 2016". InsideEVs.com. Retrieved 2017-01-26. A total of 14,795 Leafs were sold in Japan in 2016, and a total of 72,494 units since its inception. ^ Shirouzu, Norihiko; Lienert, Paul (2015-10-28). "Auto power play: Japan's hydrogen car vs China's battery drive". Reuters. Retrieved 2016-06-19. ^ Deign, Jason (2015-02-10). "Japan Makes a Big Bet on the Hydrogen Economy". Green Tech Media. Retrieved 2016-06-19. ^ a b "Fact Sheet - Japanese Government Incentives for the Purchase of Environmentally Friendly Vehicles" (PDF). Japan Automobile Manufacturers Association. Archived from the original (PDF) on 2010-12-26. Retrieved 2010-12-24. ^ "The Motor Industry of Japan 2010" (PDF). Japan Automobile Manufacturers Association. Retrieved 2010-12-24. See pages 45–46. ^ "Japan's measures to withstand impact of global crisis on its automotive industry - JAMA shares at the 4th Indonesia International Automotive Conference". News from JAMA Asia. Japan Automobile Manufacturers Association (36). September 2009. Retrieved 2010-06-06. ^ "Sales Promotion Scheme and 2009 Vehicle Sales Forecasts - Japan: Rebate for purchase or replacement with eco-friendly vehicles". Marklines.com. Archived from the original on 2009-04-26. Retrieved 2010-06-06. ^ Jose, Pontes (2016-02-08). "Japan December 2015". EVSales.com. Retrieved 2016-02-25. ^ a b "三菱 i-MiEVなどの2014年12月度 生産・販売実績" [Mitsubishi i-MiEV production and sales results for December 2014] (in Japanese). Electric Vehicle News. 2015-01-28. Archived from the original on 2015-02-17. Retrieved 2015-02-18. ^ Mark Kane (2013-06-10). "Mitsubishi's BEV Vehicle Sales Tumbling in Japan as Outlander PHEV Dominates". InsideEVs.com. Retrieved 2013-06-16. ^ Jay Cole (2013-01-24). "Mitsubishi Outlander PHEV On Sale In Japan Today, Extended Promotional Video Released". Inside EVs. Retrieved 2013-01-28. ^ Mark Kane (2014-01-14). "Sales Of Mitsubishi MiEV in Japan Fell Off Sharply in 2013; Battery Production Constraints Probable Cause". InsideEVs.com. Retrieved 2014-02-14. ^ "Nissan delivers first Leaf in Japan". The Green Car Website. 2010-12-22. Retrieved 2010-12-23. ^ "Nissan delivers first LEAF cars in Japan". International Business Times. 2010-12-22. Retrieved 2010-12-23. ^ "Toyota Is Global Hybrid Leader With Sales Of 7 Million" (Press release). Torrance, California: PR Newswire. 2014-10-13. Retrieved 2014-10-18. ^ Takashi Mochizuki (2014-09-08). "Tesla's Musk, in Tokyo, Says 'Heart' of Model S Is Japanese". The Wall Street Journal. Retrieved 2014-09-08. ^ Kane, Mark (2016-09-19). "Mitsubishi Outlander PHEV Sales In Japan Down Nearly 90% In July". InsideEVs.com. Retrieved 2016-10-01. ^ "三菱 アイミーブなどの2016年８月度 販売実績" [Mitsubishi i-MiEV production and sales results for August 2016]. Electric Vehicle News (in Japanese). 2016-09-28. Archived from the original on 2016-10-01. Retrieved 2016-10-01. A total of 34,830 Outlander P-HEVs have been sold in Japan through August 2016. ^ Kosova, ProCredit Bank. "ProCredit Bank, the first institution in Kosovo to use electric vehicles - News - ProCredit Bank Kosova". ProCredit Bank Kosova. Retrieved 2018-05-23. ^ "It's electric! Kosovo teens build battery-powered car - Prishtina Insight Prishtina Insight". prishtinainsight.com. Retrieved 2018-05-23. ^ "Kosovo makes its first electric car - DigitalSpoiler". digitalspoiler.com. Retrieved 2018-05-23. ^ "Kosovo's maker-space is building their own Electric Car - DigitalSpoiler". digitalspoiler.com. Retrieved 2018-05-23. ^ "The first electric car in Kosovo". www.youseefor.me. Retrieved 2018-05-23. ^ "Nissan alista puntos de recarga del Leaf" (in Spanish). CNN Expansion. 2010-06-02. Retrieved 2010-09-26. ^ "Nissan aims to bring electric car to Mexico City in 2011". Market Watch. 2009-10-28. Retrieved 2010-09-26. ^ "Nissan entregó los primeros LEAF en México". Univision (in Spanish). 2011-09-28. Retrieved 2011-10-06. ^ Nissan (2011-09-26). "Nissan delivers three of 100 Leaf taxis to government of Mexico City". AutoblogGreen. Retrieved 2011-10-06. See details in Press Release. ^ "Nissan Leaf heading south of the border to Mexico City". AutoblogGreen. 2009-11-03. Retrieved 2010-09-26. ^ Philippe Crowe (2013-02-14). "Mexico's Leaf Taxi Pilot Program Well Received". HybridCars.com. Retrieved 2013-05-14. ^ a b "Autos eléctricos, una moda costosa en México" [Electric cars, one costly fashion in Mexico]. Vanguardia (in Spanish). 2012-10-15. Retrieved 2013-05-14. ^ Mike Millikin (2014-06-06). "Nissan launches LEAF sales in Mexico; first company to sell a 100% electric vehicle there". Green Car Congress. Retrieved 2014-06-08. ^ "BMW Group México entrega el primer BMW i3 en el país" [BMW Group Mexico delivers the first BMW i3 in the country] (Press release) (in Spanish). Mexico D.F. : BMW Group. 2014-09-29. Retrieved 2014-10-18. ^ Owner receives the first 2015 BMW i3 in Mexico (2014-10-03). "Propietario recibe el primer BMW i3 2015 en México". Auto Cosmos (in Spanish). Retrieved 2014-10-18. ^ Mark Kane (2015-12-26). "2016 Chevrolet Volt Now On Sale In Mexico". InsideEVs.com. Retrieved 2015-12-26. ^ Mark Kane (2015-12-24). "Tesla Model S Now On Sale In Mexico". InsideEVs.com. Retrieved 2015-12-24. See more details in video (in Spanish). ^ a b Rijksdienst voor Ondernemend Nederland (RVO) (January 2014). "Cijfers elektrisch vervoer - Aantal geregistreerde elektrische voertuigen in Nederland - Top 5 geregistreerde modellen elektrische auto (31-12-2013)" [Figures electric transport - Number of registered electric vehicles in Netherlands and Top 5 registered electric vehicle models (12-31-2013)] (PDF) (in Dutch). RVO (Dutch National Office for Enterprising). Archived from the original (PDF) on 2014-05-31. Retrieved 2014-09-17. See under the heading "31-12-2013" for total registrations figures at the end of December 2013. ^ Rijksdienst voor Ondernemend Nederland (RVO) (January 2016). "Cijfers elektrisch vervoer – Aantal geregistreerde elektrische voertuigen in Nederland – Top 5 geregistreerde modellen PHEVe elektrische auto (31-12-2015) – Top 10 geregistreerde modellen volledig elektrische auto (31-12-2015)" [Figures electric transport – Number of registered electric vehicles in Netherlands – Top 5 registered PHEV models (31-12-2015) – Top 10 registered fully electric vehicle models (31-12-2015)] (PDF) (in Dutch). RVO (Dutch National Office for Enterprising). Retrieved 2016-03-13. ^ a b c "Cijfers elektrisch vervoer – Top 5 geregistreerde modellen PHEVe elektrische auto – Top 10 geregistreerde modellen volledig elektrische auto" [Figures electric transport – Top 5 registered PHEVs – Top 10 registered fully electric vehicle models] (PDF). Rijksdienst voor Ondernemend Nederland (RVO) - Dutch National Office for Enterprising - (in Dutch). BovagWebsite. January 2017. Retrieved 2017-01-13. With a total of 25,984 Mitsubishi Outlander P-HEVs registered by the end of December 2016, the PHEV is the all-time top registered plug-in vehicle in the Netherlands. ^ RAI (2016-09-08). "EU-voertuigregistraties alternatieve brandstoffen" [EU - Registrations of vehicles with alternative fuels] (in Dutch). RAI Vereniging. Retrieved 2016-10-14. ^ Priest, Ruben (2016-01-11). "De 5 populairste semi-elektrische en elektrische auto's van 2015" [The 5 most popular PHEVs and BEV cars in 2015] (in Dutch). Groen7.nl. Retrieved 2016-03-13. ^ Loveday, Eric (2016-01-23). "Netherlands Shocks With Nearly 16,000 plug-in Car Sales In December!". InsideEVs.com. Retrieved 2016-02-08. ^ Staff (2016-01-01). "Elektrische auto" [Electric car]. Auto & Fiscus (in Dutch). Retrieved 2016-02-08. This page presents the current state of fiscal arrangements for plug-in cars in the Netherlands. ^ Sander van der Kuip (November 2011). "The potential of electric vehicles amongst Dutch lease drivers". Tilburg University. Retrieved 2013-10-11. ^ a b "Overview of Purchase and Tax Incentives for Electric Vehicles in the EU" (PDF). European Automobile Manufacturers Association. 2011-03-14. Archived from the original (PDF) on 2011-09-27. Retrieved 2011-07-31. ^ "Leaf prijzen" (in Dutch). Nissan Netherlands. Retrieved 2010-05-19. ^ Sam Abuelsamid (2010-05-17). "Nissan announces European prices for Leaf, under €30,000 after incentives". AutoblogGreen. Retrieved 2010-05-19. ^ Nederlandse Omroep Stichting (NOS) (2013-12-24). "Forse toename elektrische auto's" [Major increase in electric car sales]. NOS (in Dutch). Retrieved 2013-12-26. ^ Graeme Roberts (2010-05-17). "UK: Nissan Leaf costlier in Europe even with incentives". Just-Auto. Retrieved 2010-05-17. ^ a b Elisabeth Rosenthal (2013-02-09). "Plugging In, Dutch Put Electric Cars to the Test". The New York Times. Retrieved 2013-02-11. ^ a b "Monthly electric and hybrid light vehicle tables". Ministry of Transport New Zealand. Retrieved 2018-04-04. ^ "Electric Vehicles". Ministry of Transport New Zealand. 2016-10-03. Retrieved 2016-10-03. ^ Norwegian Road Federation (OFV) (January 2015). "Bilsalget i 2015" [Car sales in 2015] (in Norwegian). OFV. Archived from the original on 2016-02-09. Retrieved 2016-03-05. Registrations of new plug-in vehicles totaled 25,779 electric cars (zero emission vehicles totaled 25,788 accounting for 9 hydrogen vehicles), 7,964 PHEVs and 712 BEV vans in 2015. In addition, registrations of used imports totaled 5,122 electric cars and 55 electric vans. plug-in vehicle registrations totaled 39,632 units. ^ Norwegian Road Federation (OFV) (January 2017). "Bilsalget i 2016" [Car sales in 2016] (in Norwegian). OFV. Archived from the original on 2017-01-18. Retrieved 2017-01-11. A total of 50,875 plug-in vehicles were registered in Norway in 2016, consisting of: 24,222 new electric cars, 5,281 used imported BEV cars, 20,663 new PHEV cars, 607 new BEV vans, and 102 used imported BEV vans. ^ Norwegian Road Federation (OFV) (April 2019). "Kjøretøybestanden per 31. mars 2019" [Vehicle stock as of 31 March 2019] (in Norwegian). OFV. Retrieved 2019-04-12. ^ Figenbaum, Erik; Kolbenstvedt, Marika (June 2016). "Learning from Norwegian Battery Electric and PHEV users". Institute of Transport Economics (TØI), Norwegian Centre for Transport Research. Retrieved 2016-08-17. TØI report 1492/2016. See pp. 1. ^ Alister Doyle; Nerijus Adomaitis (2013-03-13). "Norway shows the way with electric cars, but at what cost?". Reuters. Retrieved 2013-03-15. ^ Joly, David (2015-10-16). "Norway is A Model For Encouraging Electric Car Sales". The New York Times. Retrieved 2016-02-16. ^ Agence France-Presse (2011-05-15). "Electric cars take off in Norway". The Independent. Retrieved 2011-10-09. ^ a b European Association for Battery, Hybrid and Fuel Cell Electric Vehicles (AVERE) (2012-09-03). "Norwegian Parliament extends electric car iniatives [sic] until 2018". AVERE. Archived from the original on 2013-10-24. Retrieved 2013-04-10. ^ Ole Henrik Hannisdahl (2012-01-09). "Eventyrlig elbilsalg i 2011" [Adventurous electric vehicle sales in 2011] (in Norwegian). Grønn bil. Archived from the original on 2012-02-07. Retrieved 2012-01-14. See table "Elbilsalg i 2011 fordelt på måned og merke" (Electric vehicle sales in 2011, by onth and brand) to see monthly sales for 2011. ^ Cobb, Jeff (2016-08-09). "California Continues To Pull More Than Its Weight In Plug-in Car Sales". HybridCars.com. Retrieved 2016-08-30. As of July 2016[update], California's EV concentration was 5.83 registrations per 1,000 people, the U.S. was 1.51 per 1,000. Norway exceeds California by 3.69 times, California narrowly outpaces the Netherlands by 1.04 times. ^ Cobb, Jeff (2016-09-01). "Americans Buy Their Half-Millionth Plug-in Car: Concentration of plug-in electrified car registrations per 1,000 people". HybridCars.com. Retrieved 2016-09-04. As of July 2016[update], Norway had a concentration of registered plug-in cars per 1,000 people of 21.52, the Netherlands of 5.63, California of 5.83, and the United States national average was 1.52. ^ Norsk Elbilforening (Norwegian Electric Vehicle Association) (2017-01-05). "Elbilsalget: Ned i fjor – venter ny vekst i år" [EV Sales: Down from last year - awaiting new growth this year] (in Norwegian). Norsk Elbilforening. Retrieved 2017-01-21. ^ Moberg, Knut (2017-02-06). "Bilsalget i januar 2017 - BMW foran Toyota" [Car sales in January 2017 - BMW surpassed Toyota]. Dinside.no (in Norwegian). Retrieved 2017-02-10. ^ Agence France-Presse (2017-03-06). "Half of new cars in oil-rich Norway now electric or hybrid". eNCA. Retrieved 2017-03-06. ^ Miley, Jessica (2018-10-02). "45% of New Cars Sold in Norway in September were All-Electric Vehicles". Interesting Engineering. Retrieved 2018-11-10. Despite the huge increase in new electric cars on the road, EVs still only account for roughly 10% of all of Norway's vehicles. ^ Cobb, Jeff (2016-10-11). "Almost Half The Cars Bought In Norway Last Month Were Electrified". HybridCars.com. Retrieved 2016-10-11. ^ "New (MY19) Mitsubishi Outlander PHEV - Summer 2018" (PDF) (Press release). Mitsubishi Motors. 2018. Retrieved 2018-11-02. See tables in pp. 3-4. ^ a b Øivind Skar (2018-12-04). "Nissan rundet 50.000 Leaf i Norge" [Nissan passed 50,000 Leafs in Norway] (in Norwegian). BilNorge.no. Retrieved 2019-01-09. ^ Norwegian Road Federation (OFV) (October 2018). "Kjøretøybestanden per 30. september 2018" [Vehicle stock as of 30 September 2018] (in Norwegian). OFV. Retrieved 2018-11-02. ^ a b Lars Ole Valøen. "Electric Vehicle Policies in Norway" (PDF). Archived from the original (PDF) on 2012-03-02. Retrieved 2012-10-24. ^ Norsk Elbilforening (October 2012). "The Norwegian Electric Vehicle Association". Norsk Elbilforening (Norwegian Electric Vehicle Association). Archived from the original on 2012-10-11. Retrieved 2012-10-24. ^ a b "Fortsatt godt elbilsalg i mai" [Still good EV sales in May] (in Norwegian). Grønn bil. 2013-06-05. Archived from the original on 2013-08-07. Retrieved 2013-06-06. ^ "Billigere PHEVer fra 1.juli" [Cheaper PHEVs from 1 July] (in Norwegian). Grønn bil. 2013-06-05. Archived from the original on 2013-08-07. Retrieved 2013-06-06. ^ Jeff Cobb (2015-04-20). 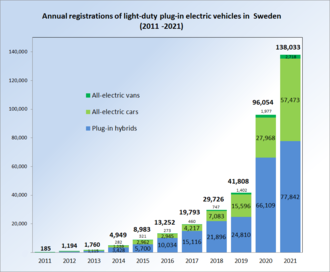 "Norway Celebrates 50,000th Plug-in Car Sold; Will EV Incentives Continue?". HybridCars.com. Retrieved 2015-04-20. ^ Petter Haugneland (2015-04-20). "50.000 elbiler på norske veier!" [50,000 electric cars on Norwegian roads!] (in Norwegian). Norsk elbilforening (Norwegian Electric Vehicle Association). Archived from the original on 2015-04-25. Retrieved 2015-04-21. ^ Kristoffer Thoner; Robin Krüger (2015-02-26). "Fredningstiden for elbilene snart over" [Close season for electric cars will be over soon]. TV2 (in Norwegian). Retrieved 2015-03-15. ^ "Norway to slash electric car perks because it's costing government too much money". Agence France-Presse. 2015-05-07. Retrieved 2016-03-06. ^ "Samarbeidspartiene enige om bilavgifter" [Cooperative parties agreed vehicle taxes]. Dagens Næringsliv (in Norwegian). 2015-05-06. Retrieved 2016-03-06. ^ Staff (2018-01-08). "Få landsoversikt over gratis elbilparkering" [A county overview of free car parking] (in Norwegian). Norsk Elbilforening (Norwegian Electric Vehicle Association). Retrieved 2018-11-13. ^ Blaker, Magnus (2016-02-29). "NTP: Nå kommer elbil-bakrusen" [NTP: Now Comes EV Hangover] (in Norwegian). Side3.no. Retrieved 2016-03-06. ^ "NTP: Klimautslippene må kuttes" [NTP: Greenhouse gas emissions must be cut] (in Norwegian). Norwegian Coastal Administration. 2016-02-29. Retrieved 2016-03-06. ^ Cobb, Jeff (2016-03-08). "Norway Aiming For 100-Percent Zero Emission Vehicle Sales By 2025". HybridCars.com. Retrieved 2016-03-09. More than 90,000 light-duty vehicles are registered in Norway as of February 2016[update]. ^ "Future of Electric Vehicles in Pakistan". Techjuice. Retrieved 1 September 2018. ^ "Future of Electric Vehicles in Pakistan". PAGE. Retrieved 1 September 2018. ^ "Dewan Motors installs first BMW public charging station for hybrid, electric vehicles in Karachi". The Express Tribune. Retrieved 1 September 2018. ^ "Dewan Motors Installs 1st BMW Public Charging Station in Pakistan". Pakwheels. Retrieved 1 September 2018. ^ "Neon introduces electric M3 motorcycle in Pakistan". Business Recorder. Retrieved 1 September 2018. ^ Tony Pe Remando. "Silliman U launches RP's first electric car". Manila Bulletin, August 30, 2007. Retrieved 2010-05-17. ^ "2007 Electric Car News". Electric and Hybrid Cars. Retrieved 2010-05-17. ^ "What Project Green Stream is? - Klaster Green Stream" (in Polish). Green Stream. Archived from the original on 2013-06-02. Retrieved 2009-09-09. ^ Jose, Pontes (2016-01-27). "Portugal December 2015". EVSales.com. Retrieved 2016-09-10. ^ "Nissan já divulgou preço do carro eléctrico Leaf". Journal de Notícias (in Portuguese). 2010-05-17. Archived from the original on 2010-05-17. Retrieved 2010-05-17. ^ "Fim dos incentivos aos carros eléctricos" [End of fiscal incentives for electric cars] (in Portuguese). IOL Auto Portal. 2011-11-23. Archived from the original on 2014-02-25. Retrieved 2013-06-23. ^ "Україна обігнала Росію за кількістю електромобілів" [Ukraine ahead of Russia in the number of electric vehicles]. Gazeta (in Ukrainian). 2016-08-23. Retrieved 2016-09-17. ^ "GridCars: Africa's first electric commuter car". www.engineeringnews.co.za. 2010-05-28. Retrieved 2010-05-28. ^ "Electric Car Manufacturer". Optimal Energy. Archived from the original on 2016-03-05. Retrieved 2009-09-19. ^ "The Joule: Africa's first BEV car". SouthAfrica.info. 2008-10-06. Archived from the original on 2009-02-20. Retrieved 2009-09-19. ^ Ingé Lamprecht (2013-10-16). "SA's first electric car goes on sale". Money Web. Retrieved 2013-10-27. ^ "Motoe vehicle (CO2) emission levy". ^ Pontes, Jose. "South Korea Full Year 2013". EV Sales. Retrieved 6 May 2014. ^ a b Shin Eun-jin (2016-11-28). "Hybrids Dominate Eco-Friendly Vehicle Market". Chosun.com. Retrieved 2016-12-03. ^ Jose, Pontes (2016-09-23). "South Korea August 2015". EVSales.com. Retrieved 2016-08-15. ^ "Hyundai's Ioniq EV sales top 1,000 units". Yonhap News Agency. 2016-09-12. Retrieved 2016-09-22. ^ Lim, James (2016-07-10). "South Korea Formulates Ambitious Plan to Promote E-Cars". Blomberg BNA. Retrieved 2016-09-24. ^ "Las ventas de coches eléctricos en España en 2014 no son como para tirar cohetes, pero mantienen su crecimiento". motorpasionfuturo.com. ^ "El Nissan LEAF es el coche eléctrico más vendido en España en 2013". motorpasionfuturo.com. ^ "Ventas en España de coches eléctricos en 2012". motorpasionfuturo.com. ^ "Ventas en España de coches híbridos y eléctricos en 2011". motorpasionfuturo.com. ^ Jose, Pontes (2016-01-08). "Spain December 2015". EVSales.com. Retrieved 2016-09-10. ^ "Government of Spain approves subsidies for purchase of electric vehicles". Green Car Congress. 2011-05-10. Retrieved 2011-05-10. ^ Staff (2015-10-13). "Highest number of electric cars registered in Sri Lanka last month: 4 Tesla cars among them". Ada Derana Biz. Retrieved 2016-03-11. ^ Staff (2015-12-19). "Nissan Leaf good, bad and ugly". The Nation Website LK. Archived from the original on 2016-03-11. Retrieved 2016-03-10. ^ a b c d Bil Sweden (2016-01-04). "Nyregistreringar december 2015 def" [New Registrations December 2015 (final)] (in Swedish). Bil Sweden. Retrieved 2016-04-15. Download the pdf file "Nyregistreringar december 2015 def" (PressRel1512_def.pdf) See table: Nyregistrerade miljöpersonbilar december 2015. A total of 5,625 PHEVs, 2,962 BEV cars and 321 BEV vans were registered in 2015, for a total of 8,908 light-duty EVs. Passenger car registrations totaled 345,108 units in 2015. Figures for 2014 were revised. ^ a b c Bil Sweden (2015-10-02). "Urstark bilmarknad under 2014" [Exceptionally strong car market in 2014] (in Swedish). Bil Sweden. Retrieved 2015-02-22. A total of 4,656 super clean cars and 282 BEV vans were registered in Sweden in 2014. Super clean cars are those with carbon dioxide emissions of up to 50 g/km (two Porsche plug-in models, the Panamera S E-Hybrid and the 918 Spyder are not accounted as super clean cars, instead they are accounted with conventional hybrids). In 2011 there were 181 EVs registered, 928 in 2012, 1,546 in 2013 and 4,656 super clean cars were registered during 2014. Since the introduction of the super clean car rebate in January 2012 until December 2014, a total of 7,130 super clean cars have been registered. ^ a b Bil Sweden (2014-01-02). "Nyregistreringar december 2013 prel" [New registrations in December 2013 prel] (in Swedish). Bil Sweden. Retrieved 2014-01-03. Download file "Nyregistreringar december 2013 prel.pdf" see table "NYREGISTRERADE SUPERMILJÖBILAR DECEMBER 2013" with summary of PEV sales by model for 2013 and 2012. ^ a b c d "2012 (Full Year) Sweden: Best-Selling Electric Cars & PHEV Models". BestSellingCars.com. 2013-01-02. Retrieved 2014-01-03. ^ a b c d Bil Sweden (2016-01-04). "Nyregistreringar december 2016 def" [New Registrations December 2016 (final)] (in Swedish). Bil Sweden. Retrieved 2016-04-15. Download the pdf file "Nyregistreringar december 2016 def" (PressRel1612_DEF.pdf) See table: Nyregistrerade miljöpersonbilar december 2016 (def). A total of 10,257 PHEVs, 2,924 BEV cars and 273 BEV vans were registered in 2016, for a total of 13,454 light-duty EVs. Passenger car registrations totaled 372,318 units in 2016. Registrations of super green cars totaled 12,995 units, up from 8,582 in 2015. Figures for 2015 were revised. ^ "Mitsubishi Outlander PHEV clears 100,000 sales milestone in Europe". JATO Dynamics (Press release). Tokyo: Mitsubishi Motors. 2018-01-29. Retrieved 2018-02-01. ^ Desk, Lifestyle (2011-09-08). "Sweden Follows Suit with Electric Car Subsidy". The Global Herald. Archived from the original on 17 October 2011. Retrieved 13 September 2011. ^ "Fossil-free transport and travel: The Government's work to reduce the impact of transport on the climate". Government Offices of Sweden. 2016-05-25. Retrieved 2016-10-21. ^ European Automobile Manufacturers Association (ACEA) (2016-04-29). "New Passenger Car Registrations by Alternative Fuel Type in the European Union - Quarter 1 2016" (PDF). ACEA. Retrieved 2016-06-21. A total of 47,685 new passenger EVs were sold in the European Union and two EFTA countries, consisting of 23,717 BEV cars and 23,868 PHEVs (See tables pp. 2 and 3). Light-duty utility vans are not included. ^ European Automobile Manufacturers Association (ACEA) (February 2016). "New Passenger Car Registrations By Alternative Fuel Type In The European Union Quarter 4 2015" (PDF). ACEA. Retrieved 2016-02-08. See table Electric Vehicles: Total Europe (EU+EFTA), 186,170 registered units in 2015 (includes two EFTA countries: Norway and Switzerland). For Denmark and Romania only BEV vehicles are included. Electric Vehicles = BEV vehicles (BEV) + extended‐range electric vehicles (EREV) + plug‐in hybrid electric vehicles (PHEV) + fuel cell electric vehicles (FCEV). ^ Vereinigung Scheweizer Automobil-Importeure (2012-10-15). "Personenwagen nach Modellen - Modellstatistik Personenwagen 2012/2011" [Passenger cars by model - Statistic by model cars in 2012/211] (in German). Auto Schweiz. Archived from the original on 2013-08-13. Retrieved 2012-10-17. Download files ModellePW2012.xls and ModellePWQuartal2011.xls. ^ "Nissan Leaf: Marktstart mit Elektromobilitäts-Paket" (in German). Nissan News Releases. 2011-08-24. Retrieved 2011-09-18. ^ Eric Loveday (2010-11-08). "Nissan Leaf slapped with $51K price tag in Switzerland". AutoblogGreen. Retrieved 2011-05-18. ^ "e'mobile - Marché - Taxes cantonales sur les véhicules à moteurs". www.e-mobile.ch. Retrieved 2016-06-20. ^ "Taiwanese government aims to ban the sale of all petroleum vehicles by 2040 | Taiwan News". www.taiwannews.com. 10 January 2018. Retrieved 10 January 2018. ^ "Кількість зареєстрованих електромобілів та гібридів в Україні" [Number of registered EVs and HEVs in Ukraine] (in Ukrainian). ^ "Будущее едет в Украину: что ждет рынок электрокаров в 2019-м" [Future comes to Ukraine: what the EV market expects in 2019] (in Ukrainian). ^ "Самые продаваемые б/у автомобили 2018 года: рейтинг марок" [Most sold used cars in 2018] (in Ukrainian). ^ Society of Motor Manufacturers and Traders(SMMT) (7 January 2016). "December 2015 – EV registrations". SMT. Retrieved 2016-01-21. A total of 28,188 plug-in cars were registered during 2015, consisting of 9,934 BEVs and 18,254 PHEVs. A total of 2,633,503 new cars were registered in 2015. There have been 47,690 cars registered eligible to the Plug-In Car Grant. ^ Society of Motor Manufacturers and Traders(SMMT) (2012-01-06). "December 2011 – EV and AFV registrations". SMMT. Retrieved 2012-01-14. A total of 1,082 electric vehicles were registered in the UK in 2011. ^ Society of Motor Manufacturers and Traders(SMMT) (2013-01-07). "December 2012 – EV and AFV registrations". SMMT. Retrieved 2013-02-16. ^ a b c Society of Motor Manufacturers and Traders(SMMT) (2014-01-07). "December 2013 – EV registrations". SMT. Retrieved 2014-01-12. A total of 2,254 plug-in cars were registered in 2013. ^ Society of Motor Manufacturers and Traders(SMMT) (5 January 2017). "December 2016 – EV registrations". SMT. Retrieved 2017-01-09. Registrations in 2016 totaled 36,907 EVs consisting of 10,264 BEV cars and 26,643 PHEVs. Of these, a total of 35,447 cars were eligible for the Plug-in Car Grant. Since its launch in 2011, a total of 83,052 cars eligible for the PICG have been registered through December 2016. A total of 2,692,786 new cars were registered in 2016, resulting in a EV market share of 1.37% of new car sales. ^ "Charging point statistics 2019". Zap-Map. Retrieved 2019-01-17. ^ RAC Foundation. "Plug-in car grant claims". Retrieved 2019-01-17. ^ RAC Foundation. "Plug-in van grant claims". Retrieved 2019-01-17. ^ Nikki Gordon-Bloomfield (2015-02-13). "UK Government Announces Changes to Plug-in Car Incentives, Introduces Banding Based on ZEV Capabilities". Transport Evolved. Retrieved 2015-02-16. ^ a b "Plug-in car grant extended to 2018". The Guardian. 2015-12-17. Retrieved 2015-12-20. ^ a b Chris Lilly (2015-12-17). "Extension announced for Plug-in Car Grant". UK: Next Green Car. Retrieved 2015-12-20. ^ Transport for London (February 2015). "Discounts and exemptions - Ultra Low Emission Discount (ULED)". Transport for London. Retrieved 2015-02-15. Click on "Ultra Low Emission Discount (ULED)" for details. ^ "Mayoral Decision 2397: Amendments to the Congestion Charge and Low Emission Zone". Greater London Authority (GLA). 17 December 2018. Retrieved 2019-01-17. ^ Argonne National Laboratory (2018-11-26). "FOTW #1057, November 26, 2018: One Million Plug-in Vehicles Have Been Sold in the United States". Vehicle Technologies Office, US DoE. Retrieved 2018-12-01. ^ Jeff Cobb (2014-09-09). "Americans Buy Their 250,000th Plug-In Car". HybridCars.com. Retrieved 2014-09-09. As of August 2014[update], sales are led by the Chevrolet Volt PHEV with 67,698 units, followed by the Nissan Leaf electric car with 61,063 units. The total of 250,609 units sold includes 1,800 Roadsters, 1,600 Fisker Karmas, and 500 Mini Es usually not captured by most statistics. ^ California Air Resources Board (CARB) (2017-01-18). "California's Advanced Clean Cars Midterm Review: Summary Report for the Technical Analysis of the Light Duty Vehicle Standards" (PDF). CARB. Retrieved 2017-01-19. See pp. ES 44. ^ a b Cobb, Jeff (2018-01-22). "Tesla Quietly Sold 200,000th Model S Last Year". HybridCars.com. Retrieved 2018-01-22. "Tesla sold its 200,000 Model S in the fourth quarter of 2017, in October or early November, becoming the second plug-in car to cross this sales threshold after the Nissan Leaf (300,000 units by early 2017). As of December 2017[update], Tesla reported global sales of 212,874 Model S cars." ^ a b Cobb, Jeff (2017-01-05). "December 2016 Dashboard". HybridCars.com and Baum & Associates. Retrieved 2017-01-06. plug-in car sales in the U.S. totaled 157,181 units, consisting of 84,246 BEV cars and 72,935 PHEVs. The EV segment achieved a market share of 0.90% of new car sales. December sales totaled 23,288 units with a market share of 1.39%. The top selling model in 2016 was the Tesla Model S with 29,156 units sold, followed by the Chevrolet Volt (24,739) and the Tesla Model X (18,028). ^ Kane, Mark (2019-01-25). "Top 3 Plug-In Hybrid Cars In U.S. In 2018: Prius Prime, Clarity, Volt". InsideEVs.com. Retrieved 2019-01-25. The Chevrolet Volt is the best selling plug-in electric car in the U.S. with 152,144 units sold through the end of 2018. ^ Mark Kane (2019-01-03). "U.S. Tesla Sales In December 2018 Up By 249%". Inside EVs. Retrieved 2019-01-24. Cumulative sales in the U.S. of the three Tesla models available in 2018 totaled 351,298 vehicles, consisting of 143,892 Model S cars, 141,546 Model 3 cars, and 65,852 Model X SUVs, all, since inception. ^ a b "Notice 2009–89: New Qualified plug-in Drive Motor Vehicle Credit". Internal Revenue Service. 2009-11-30. Retrieved 2010-04-01. Modernizing vehicle regulations for electrification, International Council on Clean Transportation, October 2018. Plug-in Vehicles: A Case Study of Seven Markets (Norway, Netherlands, California, United States, France, Japan, and Germany), UC Davis, October 2014. Shades of Green - Electric Cars' Carbon Emissions Around the Globe, Shrink that Footprint, February 2013. [permanent dead link] The Norwegian EV success continues, Norwegian Electric Vehicle Association, June 2016.